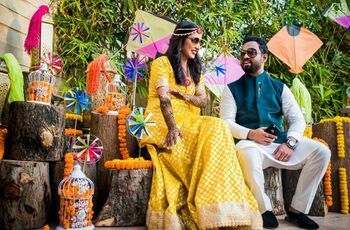 101 Rangoli Designs to Make Sure Your Wedding Is the Prettiest of Them All | Wedding Tips ARE YOU A VENDOR? 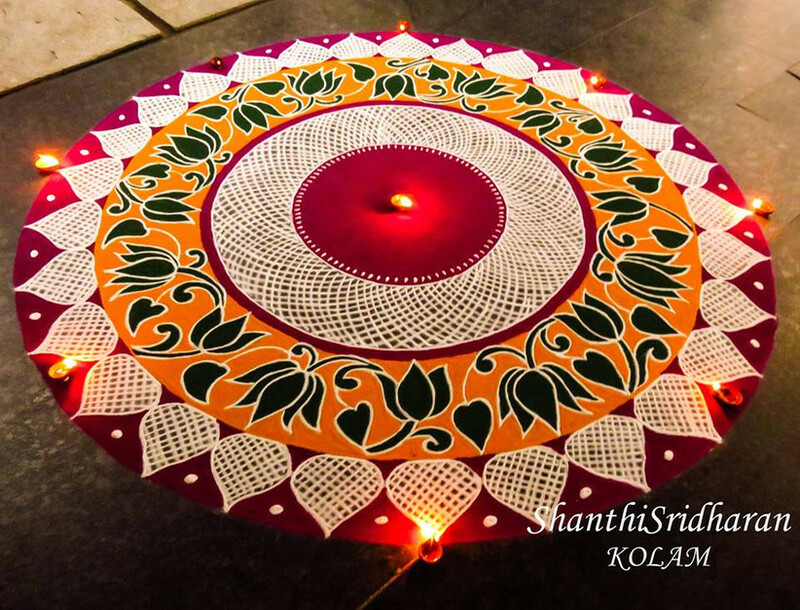 Looking for awe-inspiring rangoli designs for your wedding decor? Say no more! 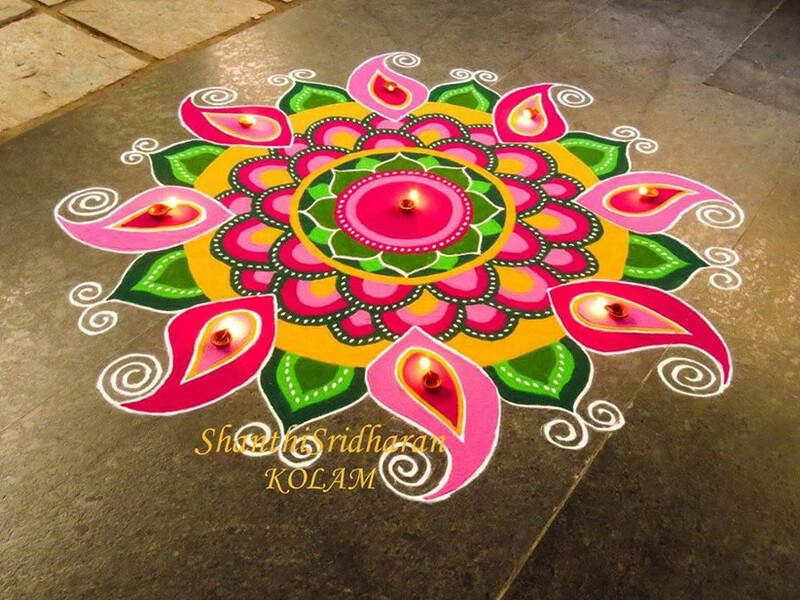 We’ve got 101 of the most beautiful, detailed and Instagram-worthy rangoli designs for you. 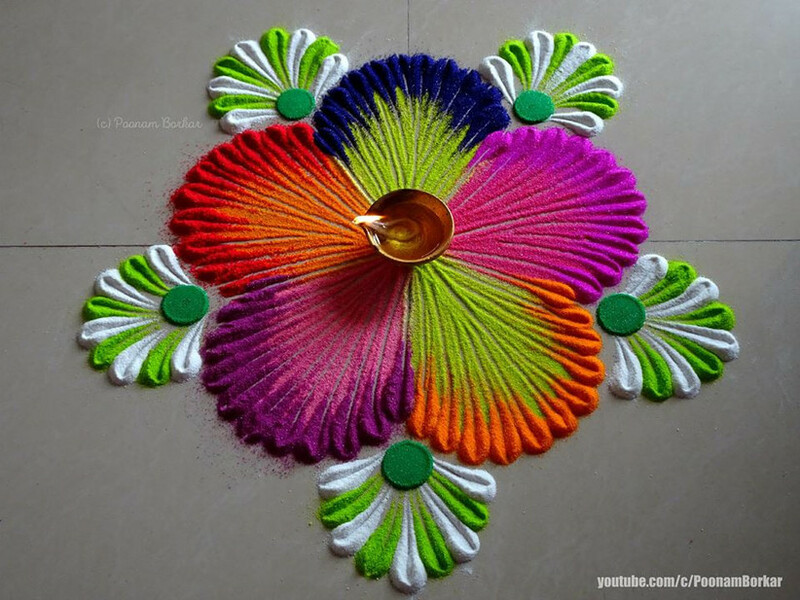 From time immemorial, a rangoli adorning someone's house has been an indicator of celebration and festivities. 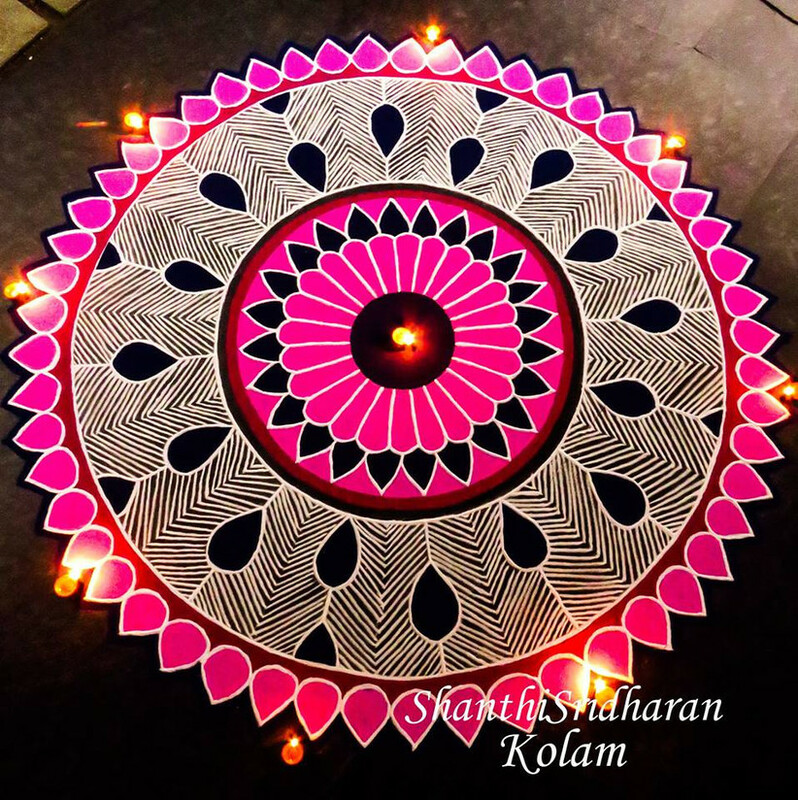 No matter what the cause of revelry - festivals, weddings, birthdays, one thing that remains constant are the ever beautiful Rangoli designs with which the members of the household decorate their abodes. 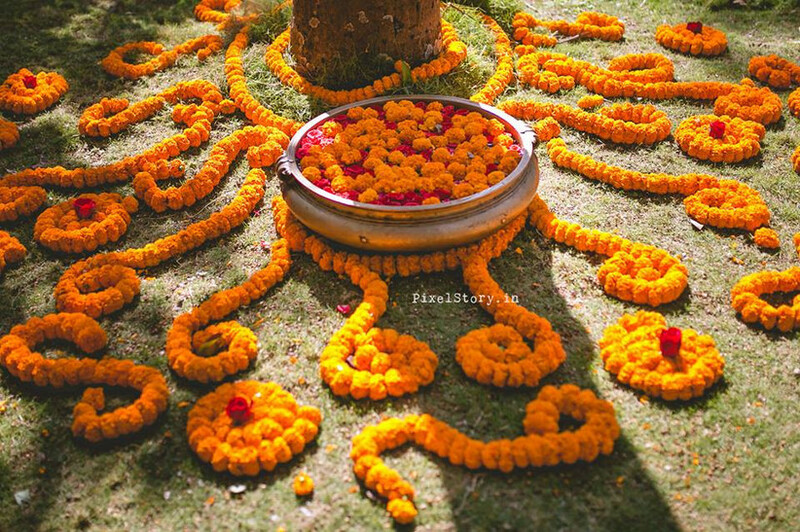 Carrying forward the same traditions in a wedding, every ritual has some beautiful Rangoli designs at the venue to amplify the prettiness all around. After all, with everything from the walls to the tables decked up, you wouldn't want the floors to be left behind, would you? 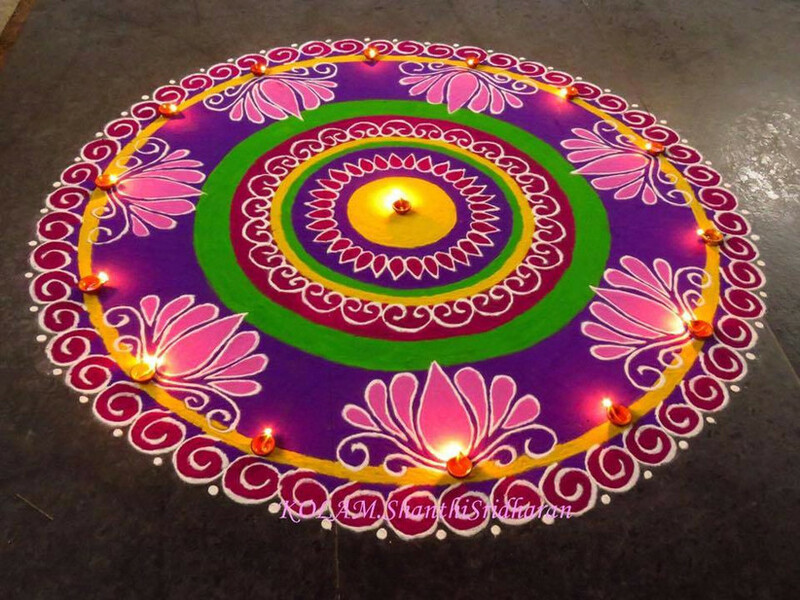 Amp up your wedding decorations with alluring rangoli designs to make that colour pop! 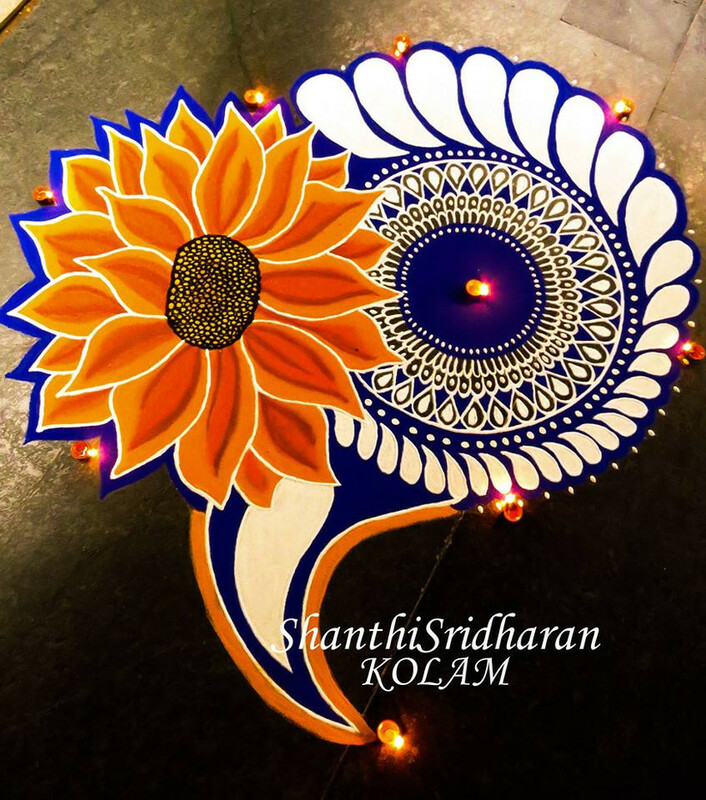 Excited about the idea of Rangoli designs but don't yet know what exactly to ask your decoration vendor? Don't worry, we've got your back. 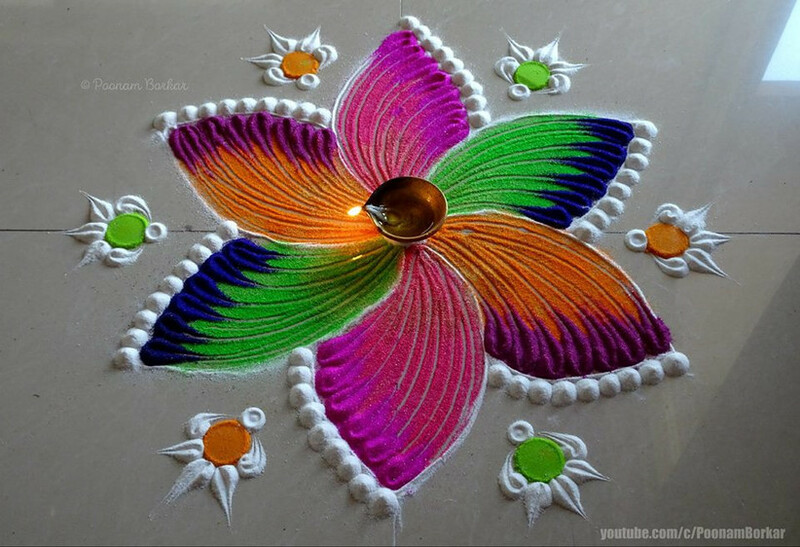 We have curated for you a bunch of aesthetic rangoli designs images which are sure to make you go Woah! The details, the techniques, the colours, what's not to like? Start scrolling and be prepared to be Ahh-mazed. 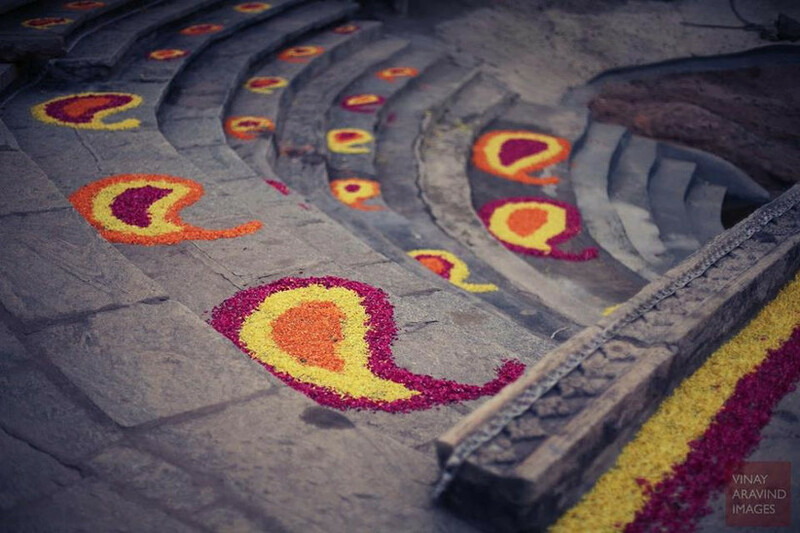 Flowers and Rangoli go hand in hand. 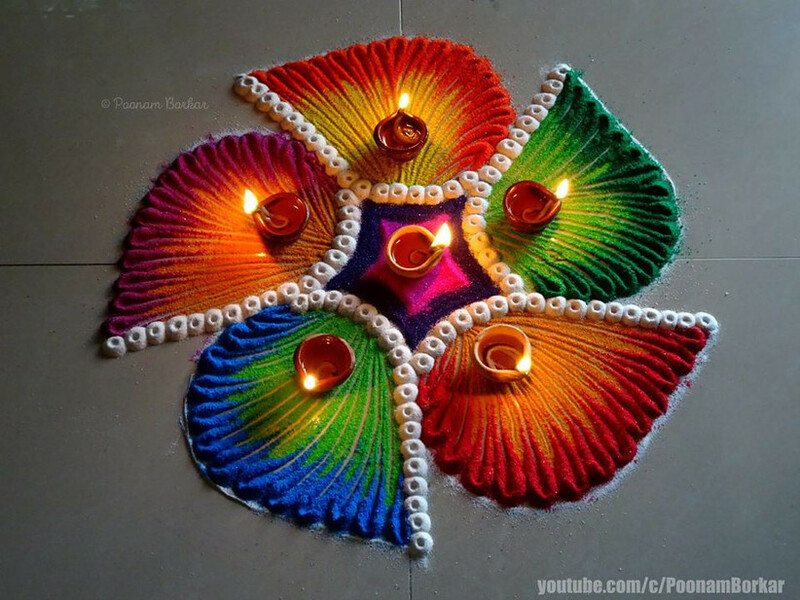 In your search for beautiful rangoli designs, you are bound to come across a lot of flowers- both as ingredients, and motifs. 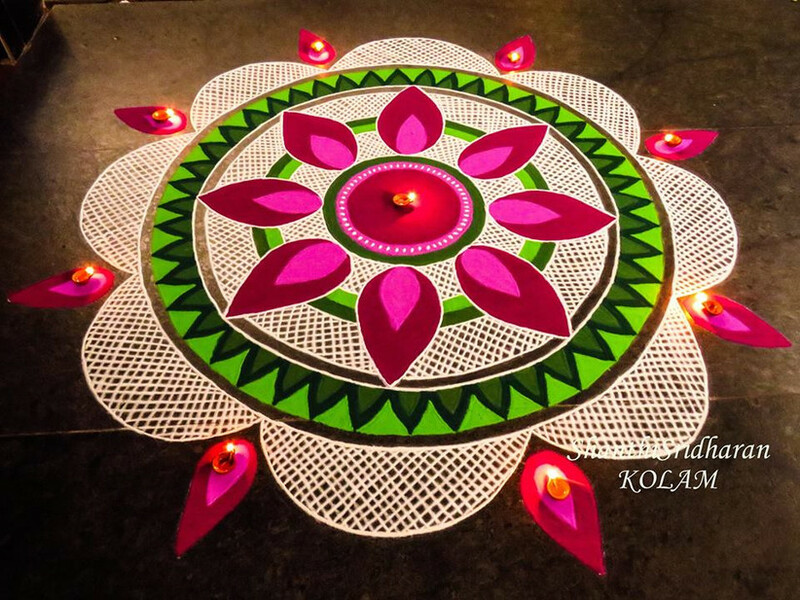 Prepare to be swooped away by these amazing rangoli designs images. 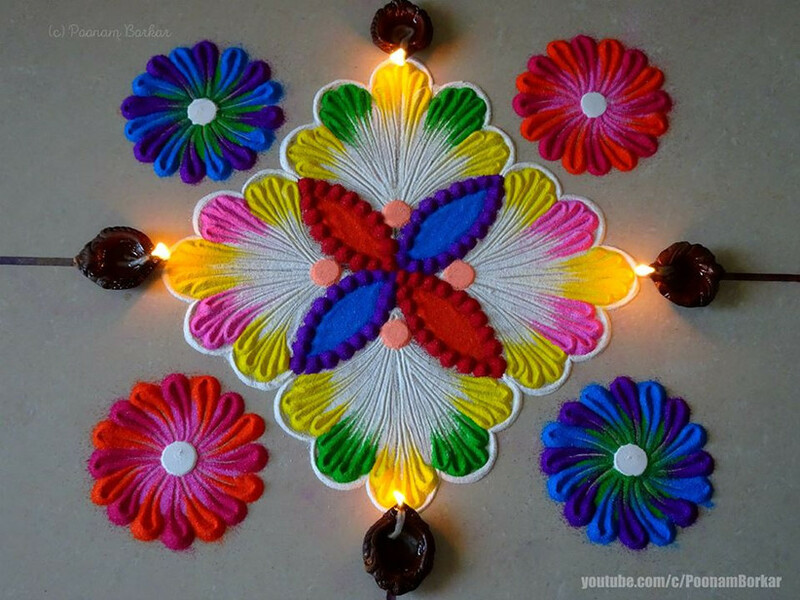 This is a great example of simple rangoli designs. The orange colour pops out quite alluringly and the mesh effect adds simple charm to the whole thing. Talking about warm hues, how can we forget the sunflower? 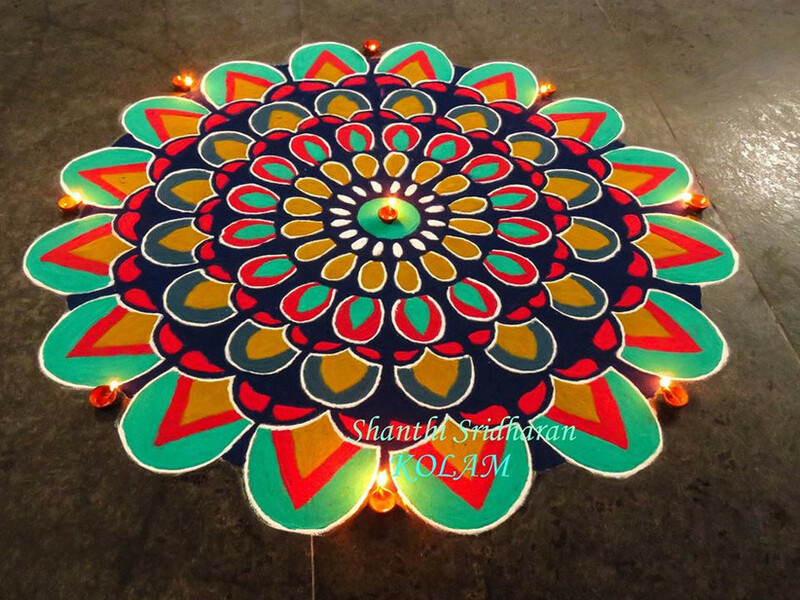 The petals for this one come out beautifully when used in rangoli designs and are good enough to be the centre of attention. 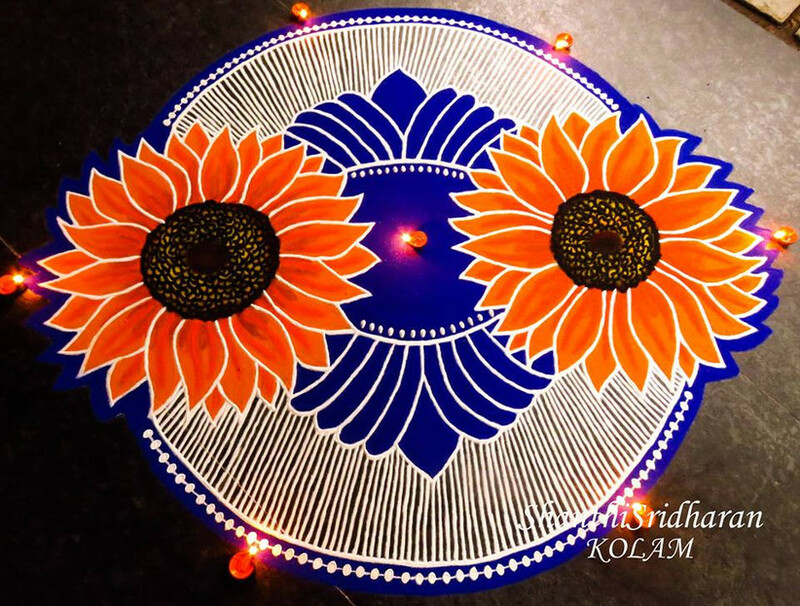 Another simple and easy rangoli design with a sunflower. The use of bold white swatches makes it look extra neat. Adding some symmetry to the line-up - what a colourful play of two imposing flowers interlinked with simple white stripes. Not only are lotuses auspicious, but they also make for a great visual treat. We are absolutely loving the 3D effect created by using dual shades for the petals. Mixing it up with two different lotuses, one in pink and one in orange. 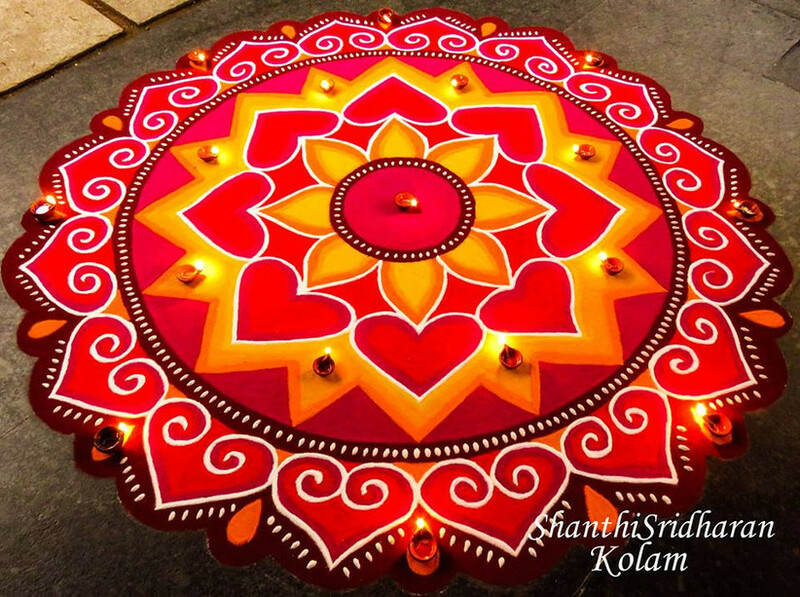 The details and the symmetry for this kind of rangoli designs are bound to take some practice. 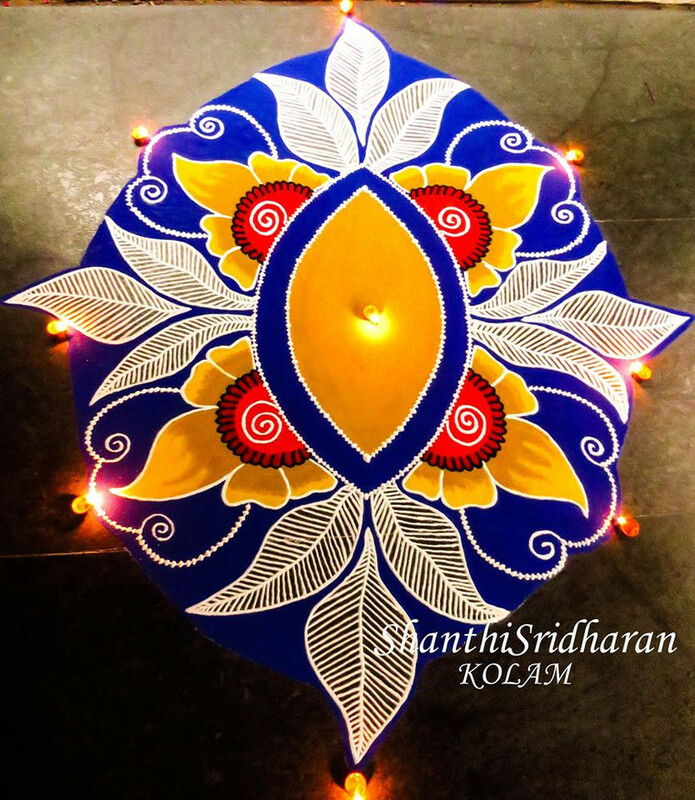 Adding a dash of blue to this lotus rangoli design is a great idea, because it immediately reminds one of a water body, the natural abode of lotuses. 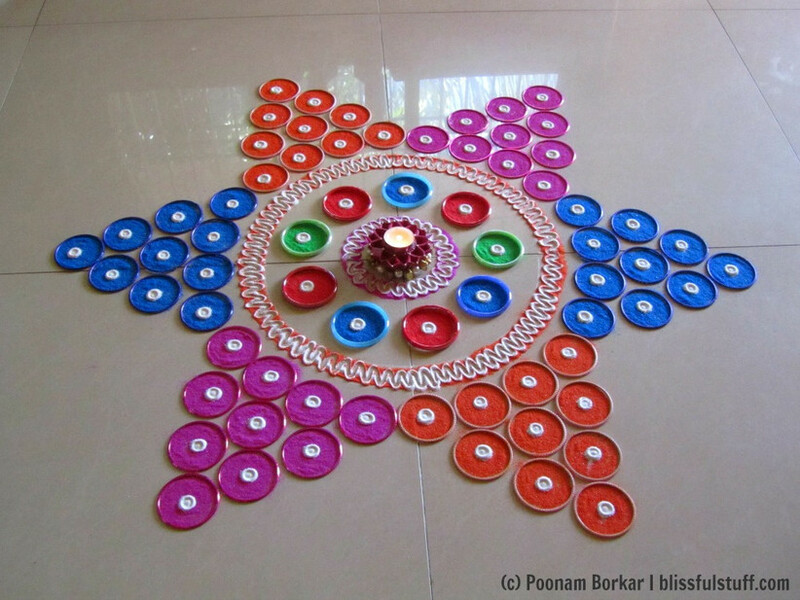 This simple rangoli design has our heart. 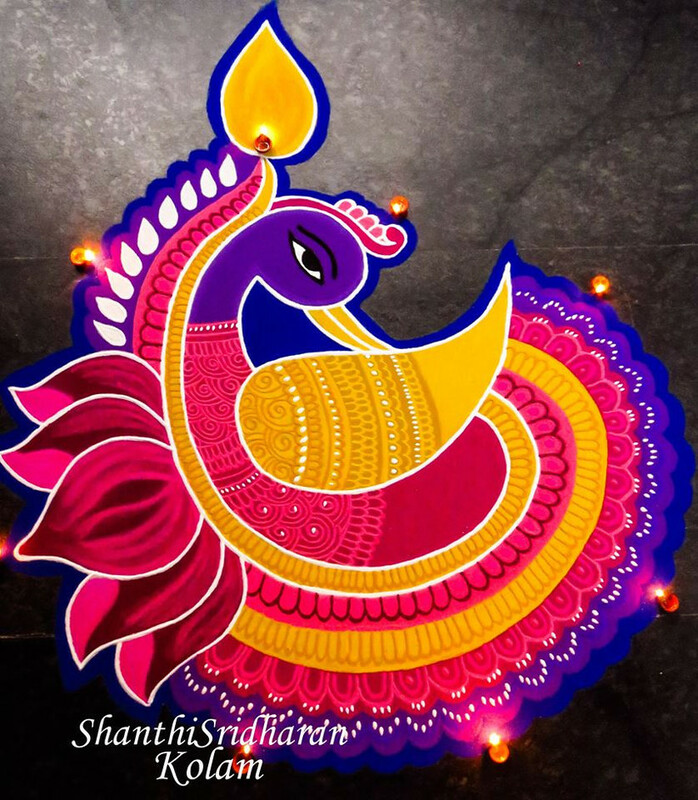 She made this using minimum colours (and techniques), and yet it is eye-catchy without being too hard on the work front. There is such a subtle charm to this one. Diyas and lotuses made with generous curves. 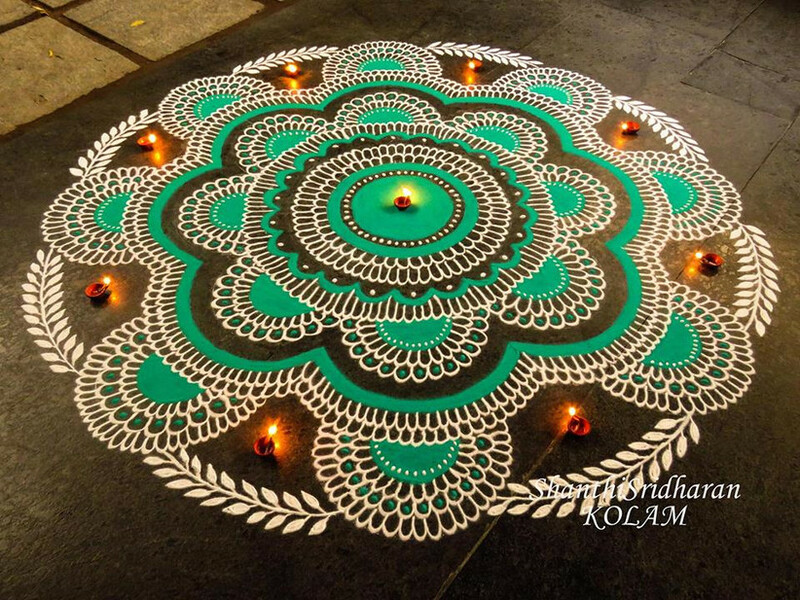 This is one of our favourite rangoli designs owing to how soothing it is to the eyes. Some petals, some dots and a whole lot of precision. The band of a neutral zone within the rangoli design simplifies the look and gives some breathing space, both to the patterns and the viewer. Fan of beauty and the beast? 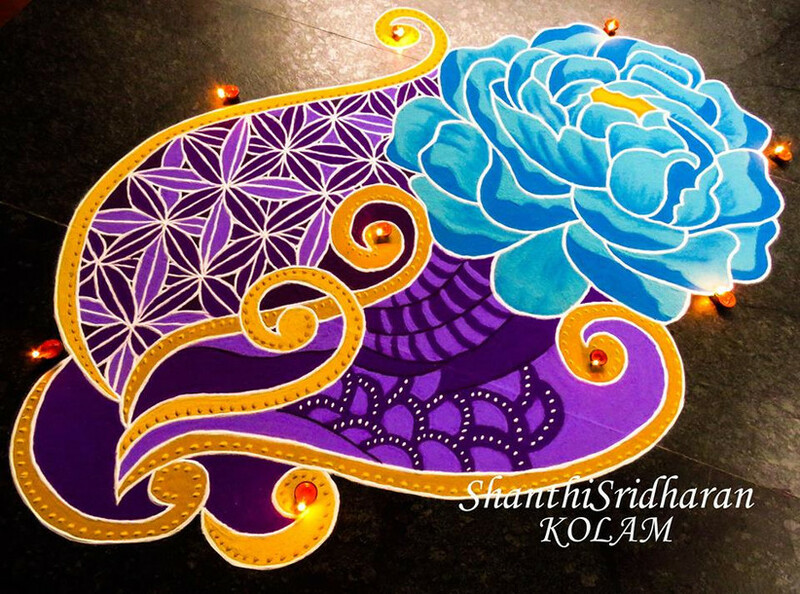 Why not have this beautiful rangoli design with a blue rose motif at the entrance to the venue? 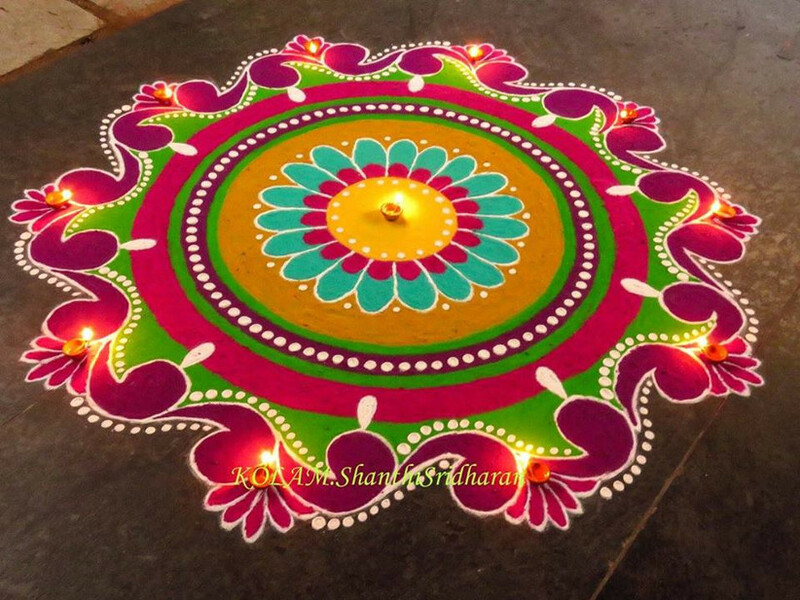 Another beautiful, yet simple specimen among rangoli designs. The petals used in this are simple enough for beginners to try and yet the end result is as breathtaking as any complicated one. 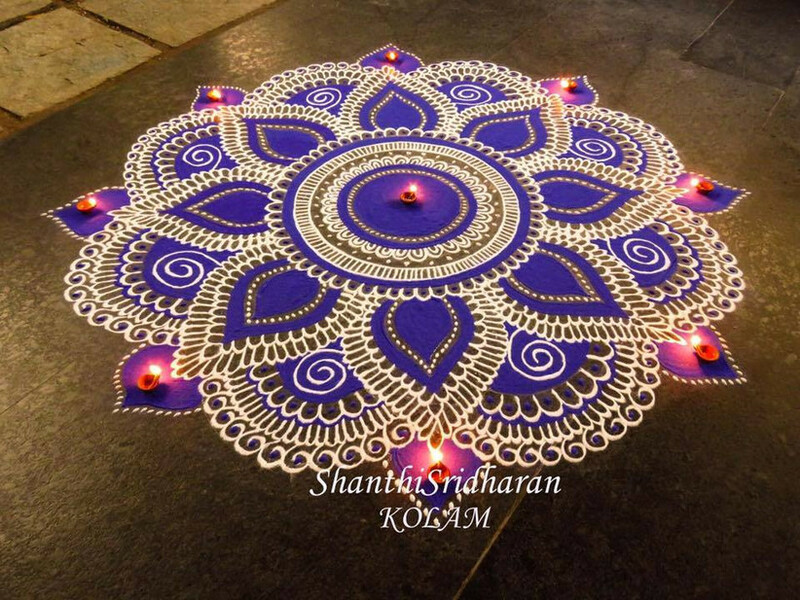 If purple is your favourite colour, then this rangoli design will immediately become the number one choice to try out. The colours blend so beautifully together and the paisley and lotus motifs give this a charming look. 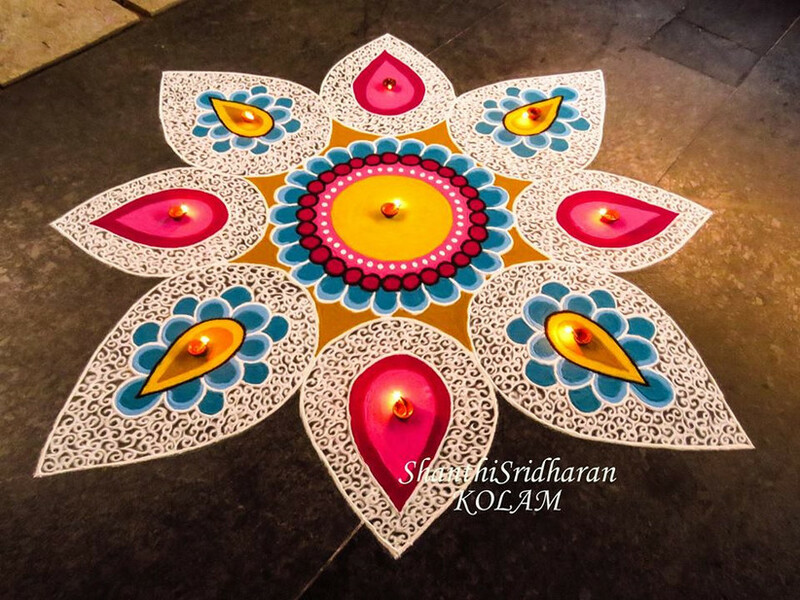 This beautiful rangoli design is great if you’re going for a sombre design which focuses more on block colours for its appeal. 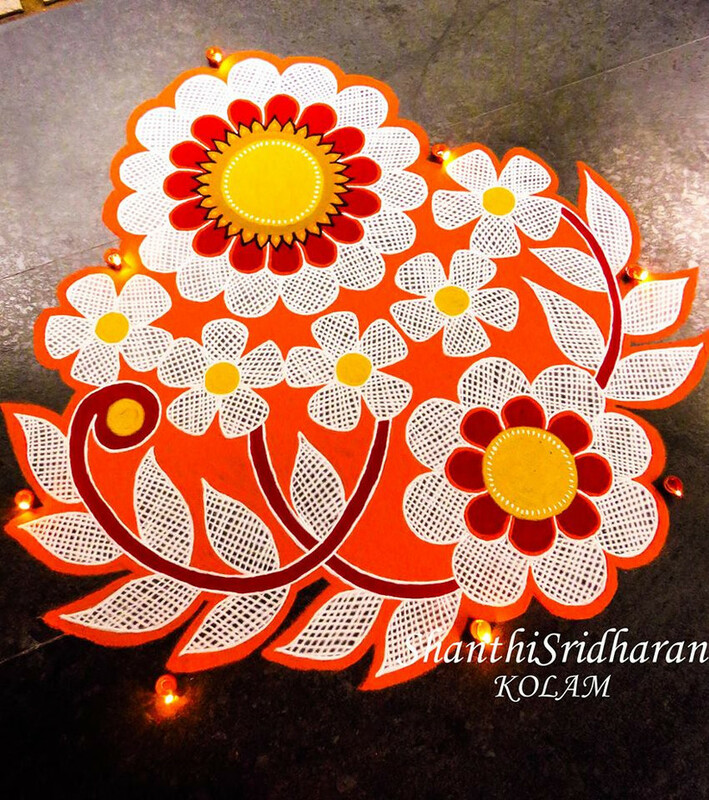 This design starts off very easy but its real beauty comes with the mesh detailing of the outermost layer of this flower motif rangoli. 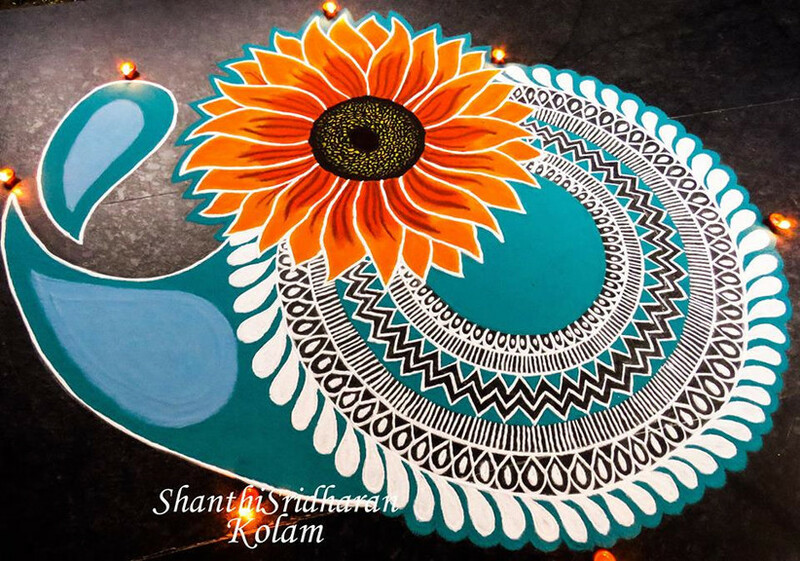 The use of two shades in this rangoli design makes it look so vibrant and quirky that we are tempted to pick it off from our screen and paste it on our notebooks and/or laptops. 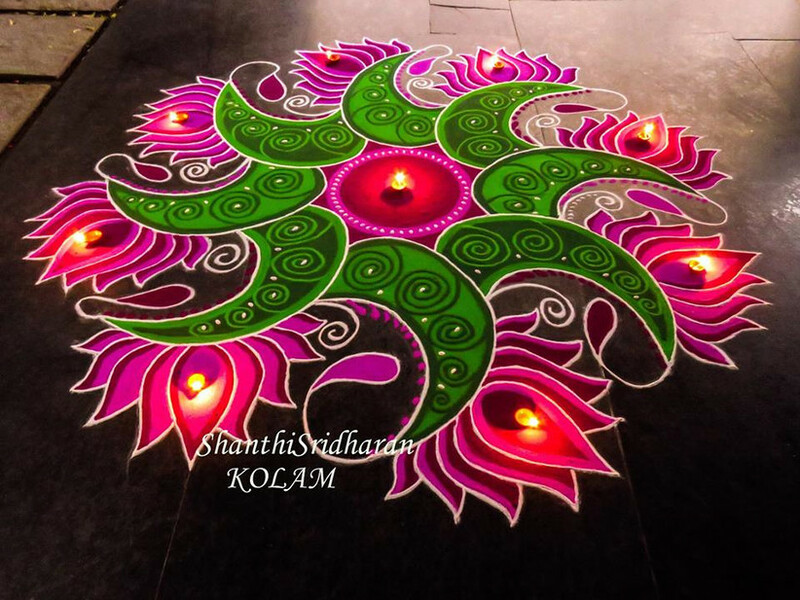 This kind of rangoli relies heavily on dots and meshes and it looks easier to make than it is. 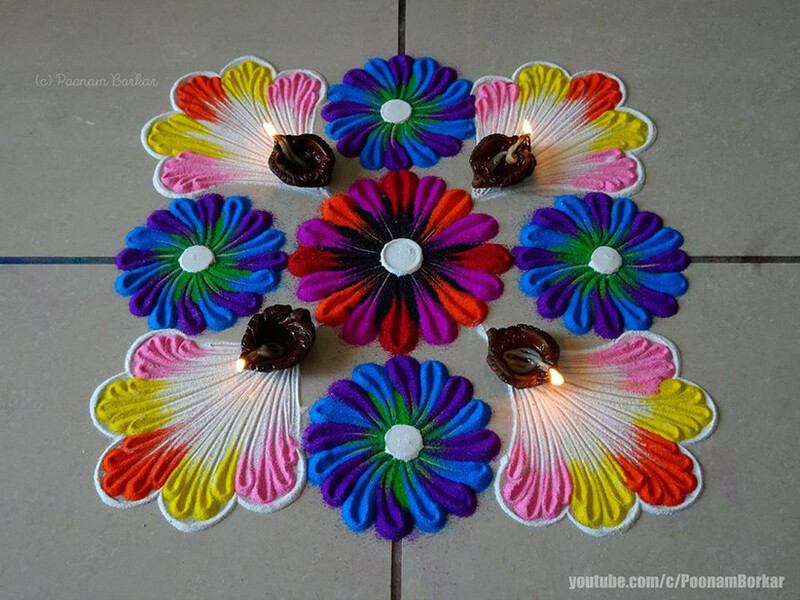 But if you want to go for a hatke look, then this is a good break from the circular/square shaped rangoli designs. 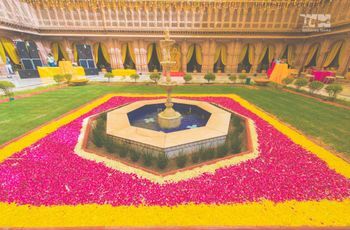 This entire venue is done up so beautifully with flowers but the centre of attraction is definitely the beautiful floral rangoli around the pot. 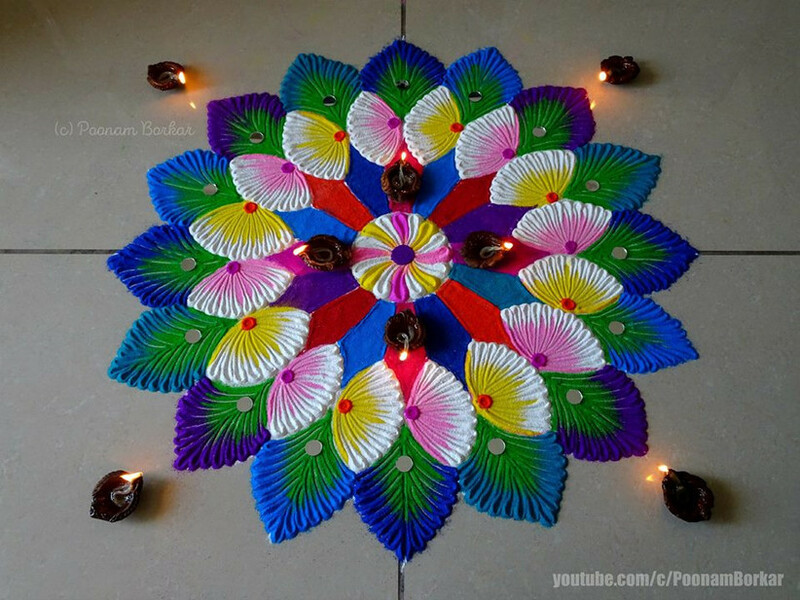 The rangoli is made using entire flowers and thus doesn't take too much time to materialise. 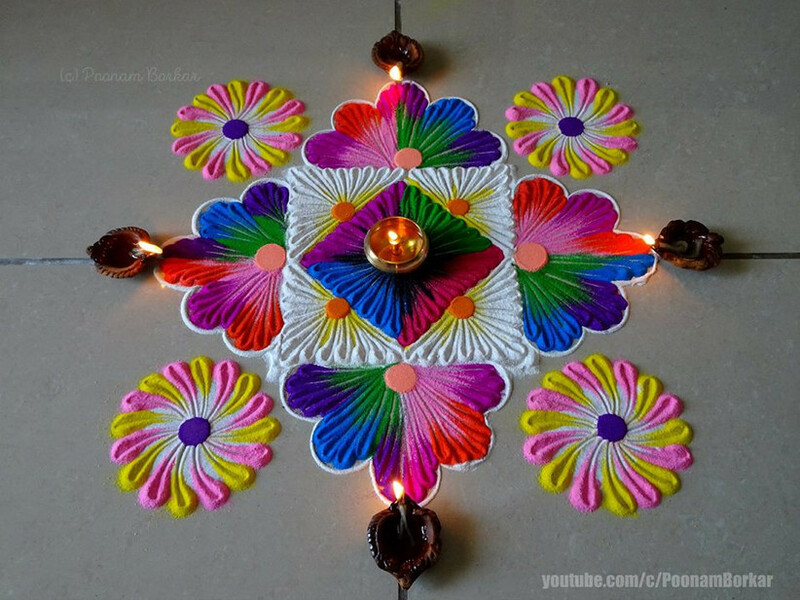 Here's another great example of simple rangoli designs using entire strings of flowers. This type of work gives you the flexibility of creating complex shapes and patterns (though large in size) and to change and modify them at your will. When it comes to flower petals though, they bring a whole different kind of versatility to the table. 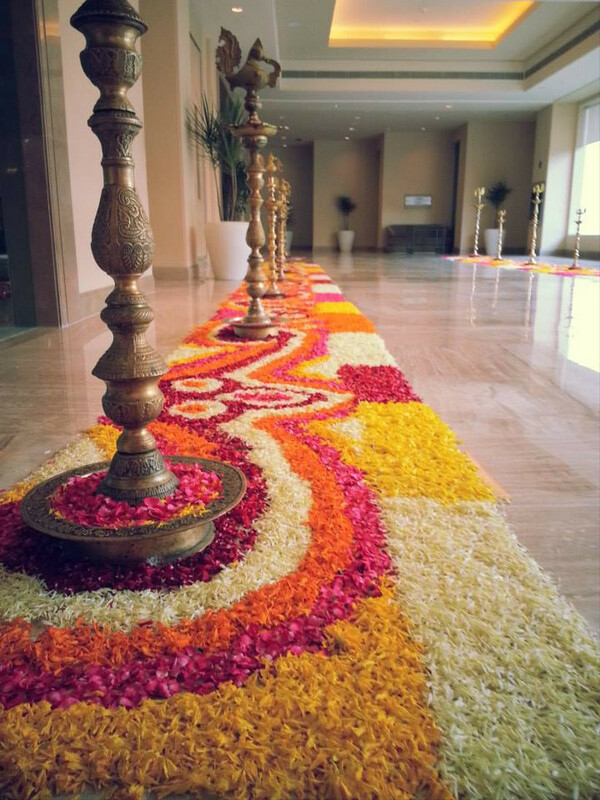 Look at these beautiful rangoli designs unified in the form of a carpet to border the reception hall. In fact, we have earlier explored some exciting wedding reception ideas which incorporate flower petals. Oh, we forgot to mention. 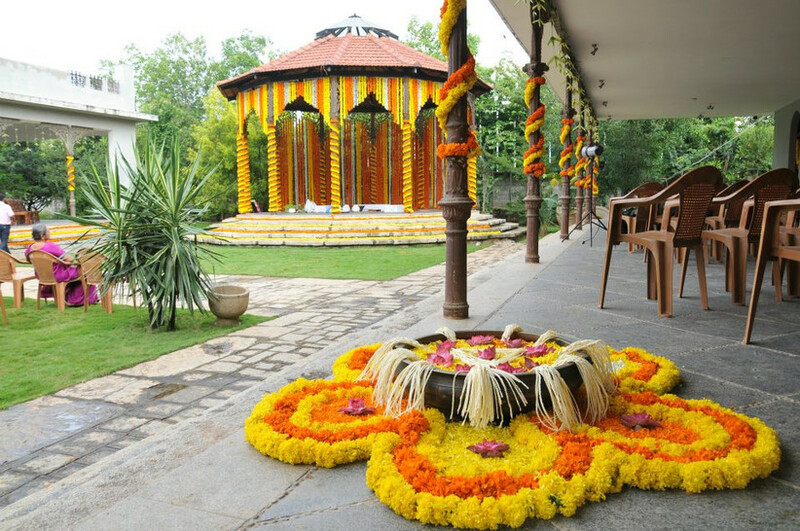 Flower garlands don't just make for great circular rangoli designs but are also your best bet if you want to beautify the entire venue and much of its empty spaces. 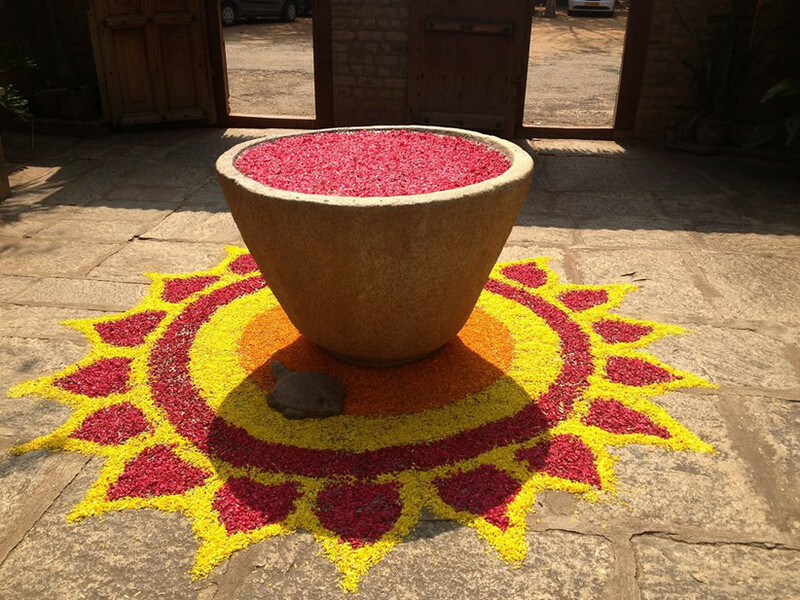 Floral rangoli designs around pots are used frequently and yet still, give spectacular results. Take for example this click-worthy work of art and marigolds. 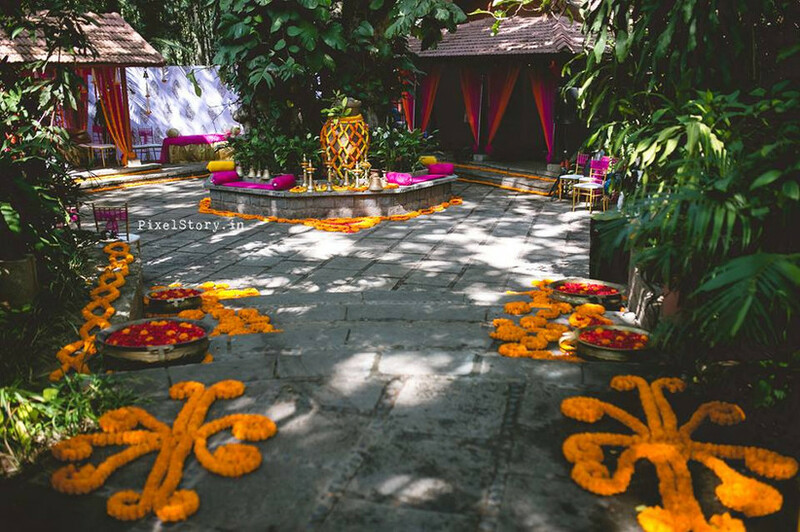 If you're going to have your wedding ceremony in the outdoors, especially with such a huge relic-like decor, add a pop of colour to the surroundings with some flower petals and simple rangoli designs like this one. You can even evoke the sun and add a sundial to your decor. And why just the venue of the main function? 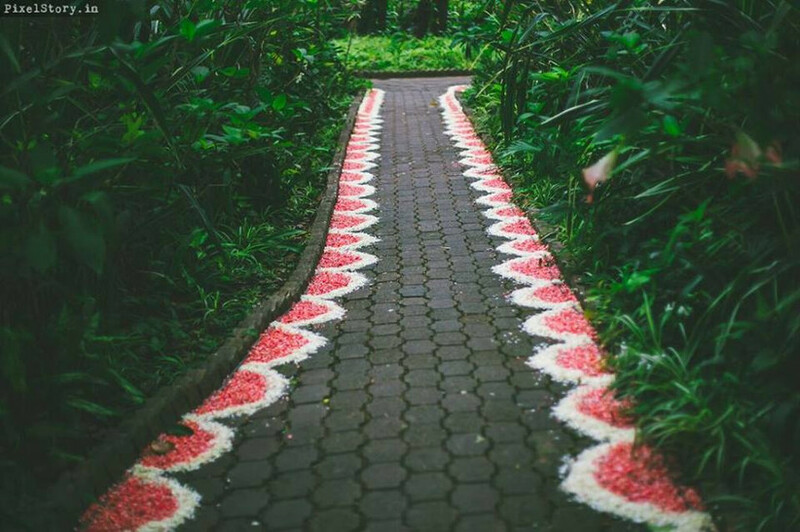 You can decorate all the pathways up to the place, so that the minute someone walks in, they know they've reached the right place. Talking about big empty spaces, outdoor weddings also seem to deal with a lot of stairways and such. 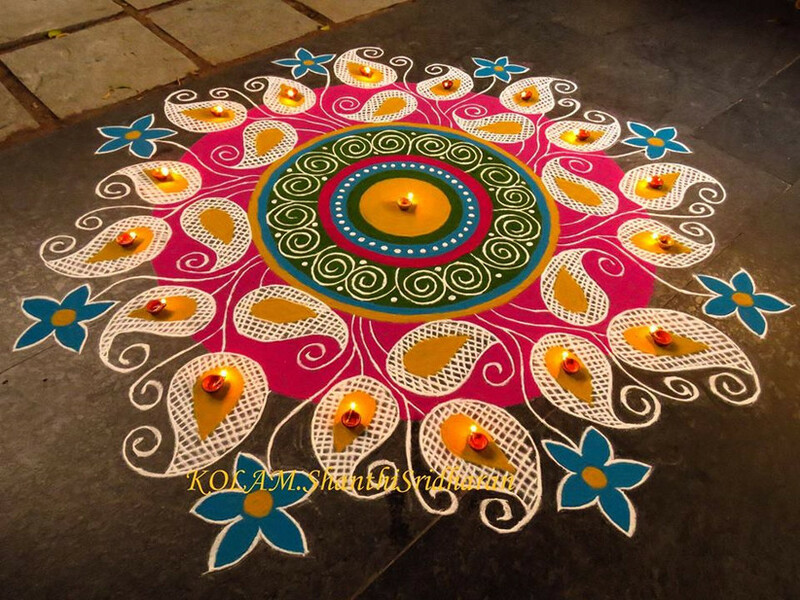 Make sure they stand out too with basic rangoli designs such as this. 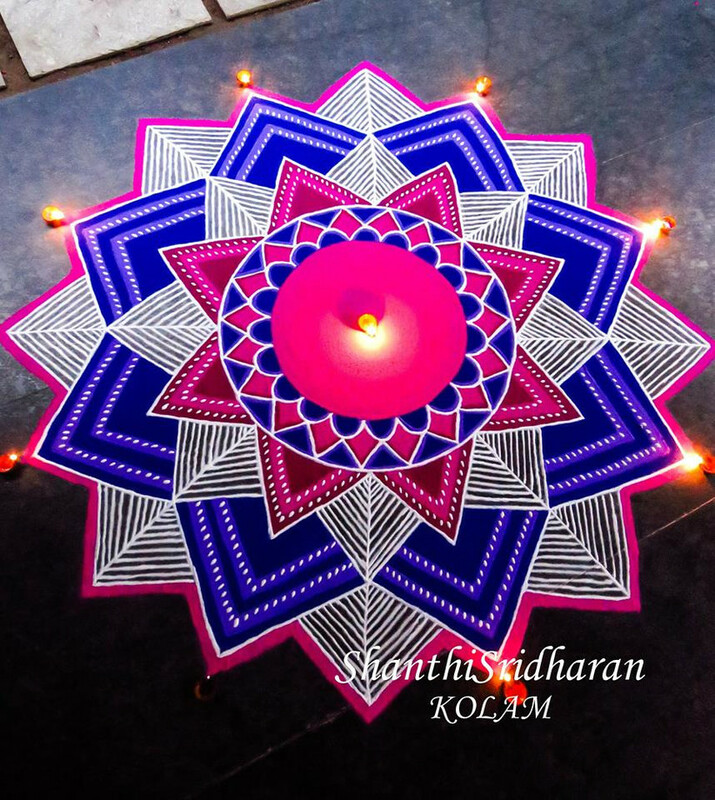 Geometric rangoli designs rely heavily on symmetry and precision, above everything else, to make the rangoli come out beautifully. The motifs can be simpler and not as elaborate, but the uniformity and the skill required to ace that final beauty is huge. 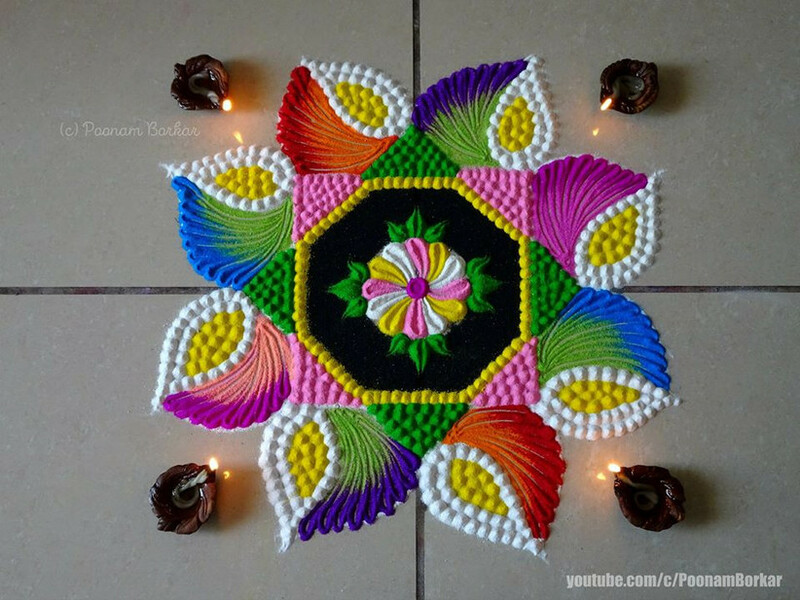 This rangoli design requires a cone, skills and a lot of patience. The shading here might not be as easy to achieve in the first few tries so don't lose heart. 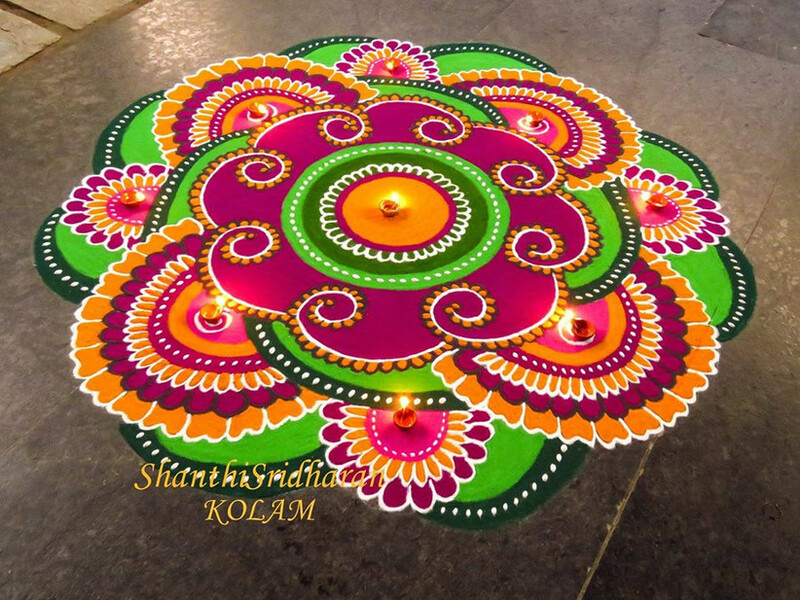 Bringing together diyas, flowers and a lot of colours, this rangoli design is bound to be a hit with your guests. 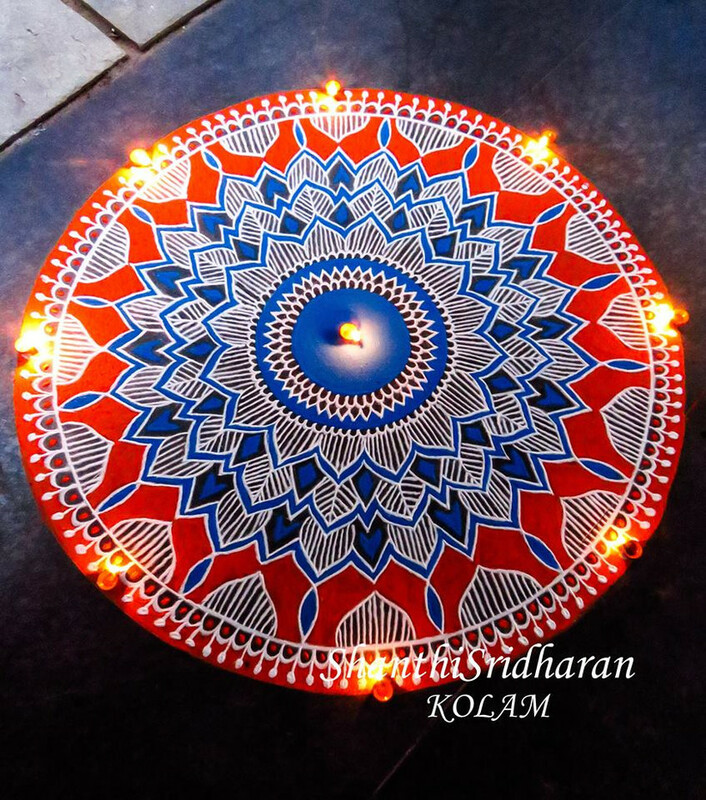 A slight variation to the previous one, in this rangoli design, the focus immediately goes to the bold colours and the glow of the lamps. This swirling design can be aced in a couple of stints if your sense of symmetry is bang on. Just looking at these perfect swirls is so satisfying, imagine making them and watching them materialise right in front of your eyes. 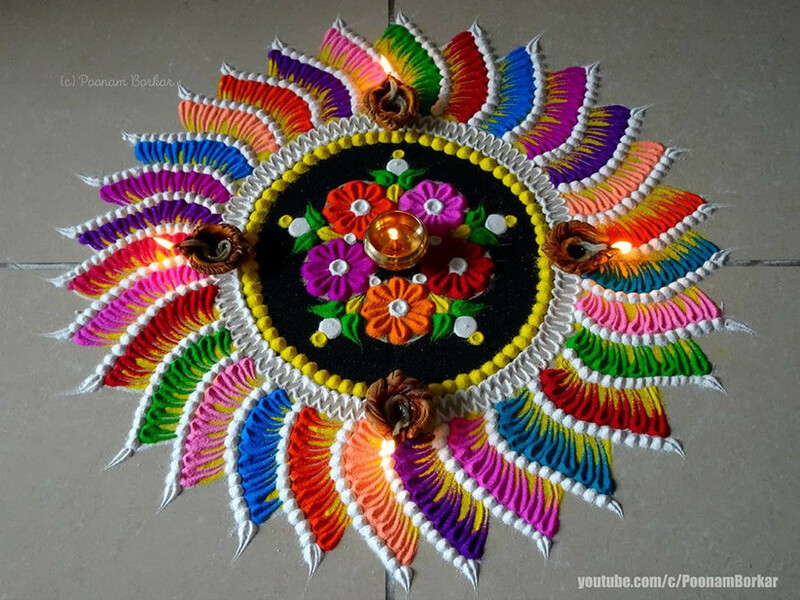 A comparatively easier design once you've mastered the art of using rangoli cones. It is nonetheless pleasing and soothing. This design is equal parts easy-to-make and tough as nails. Starts out simple and clean, then advances to very precision-based technique and then back to easy designs. 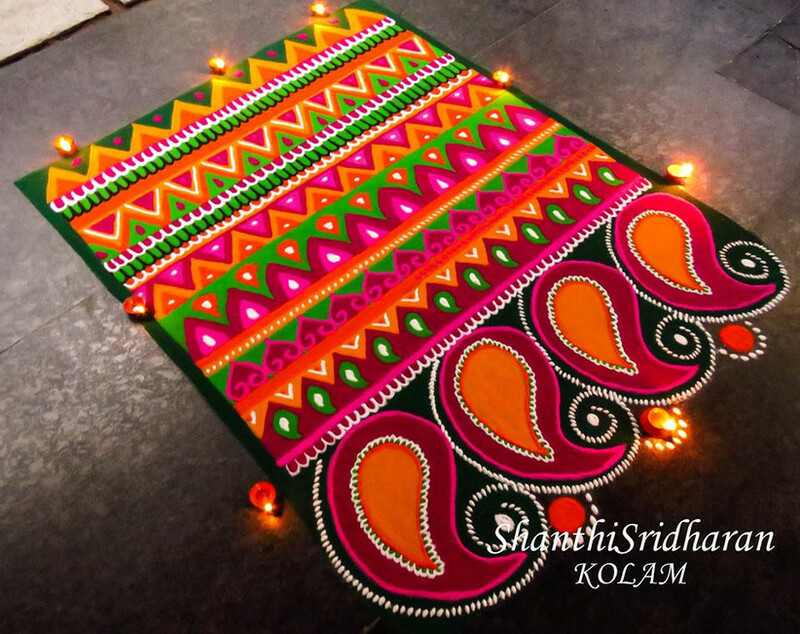 The play with dual shades is what gives these rangoli patterns an edge over others. 32. I Got the Flower! 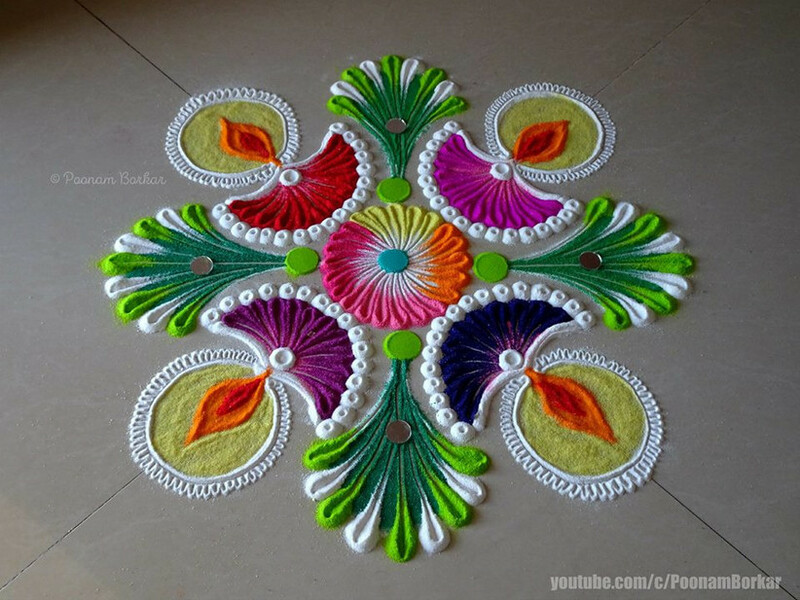 This rangoli design plays beautifully with the different shades within every petal. For beginners, you can try replicating this flower with just one primary colour and its shades. You might need a compass for this one. 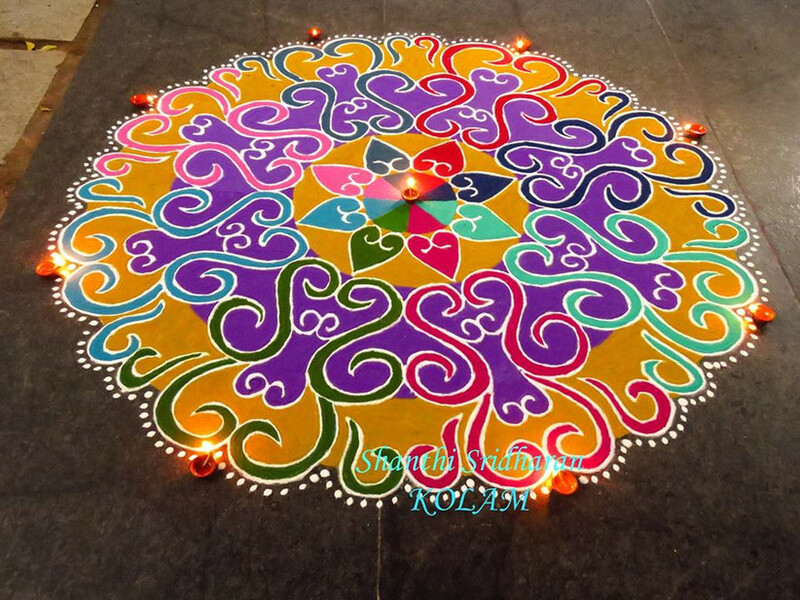 The interlinked circles are a very popular motif in rangoli designs and we can clearly see why. Swirl and flick. This design catches your eye with the swirls on the outermost layer, but the inner circle is the one that makes you say wow. Simple, elegant, on point. A more complicated version of the swirl and flick. 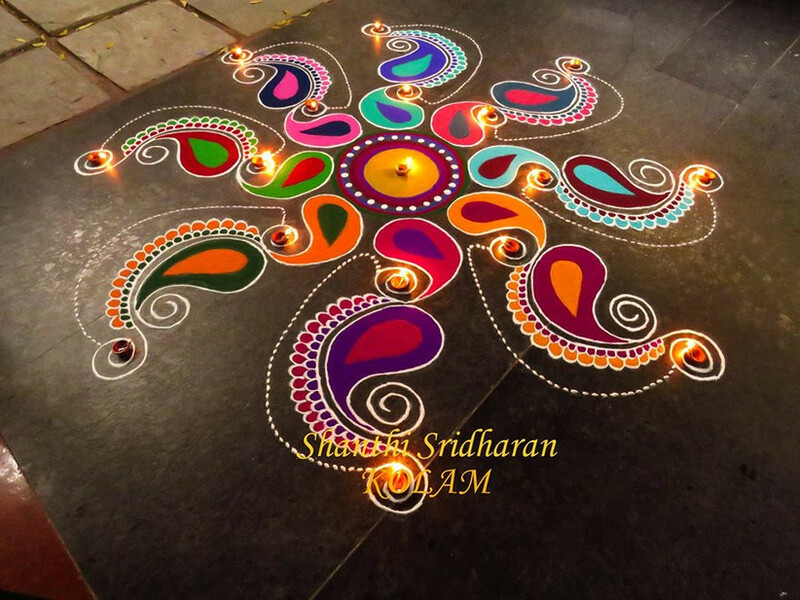 This rangoli design brings together so many technical elements- swirls, dots and shading. Master them individually and you will definitely steal the thunder at the first Diwali in your new home. The five-pointed leaf is a very popular motif in mandalas and comes out beautifully in rangoli designs too. Start with the star at the centre and then swirl your way to victory around it. This is a petite but powerful design. The detailing and the shading on this one will definitely take a trained hand. 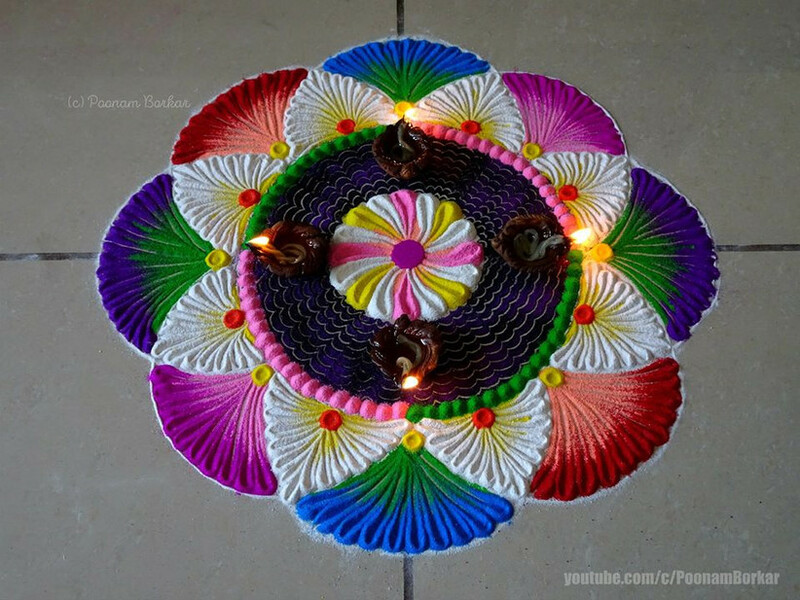 A simple, soft rangoli design. The marigold garland gives it a 3D effect and we're loving it. 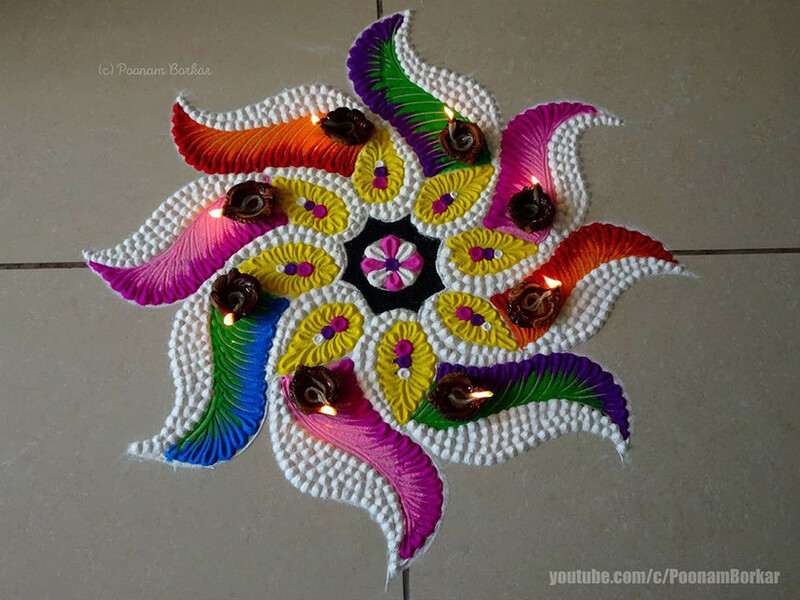 A very smooth, yet interesting rangoli design, especially for beginners to try. 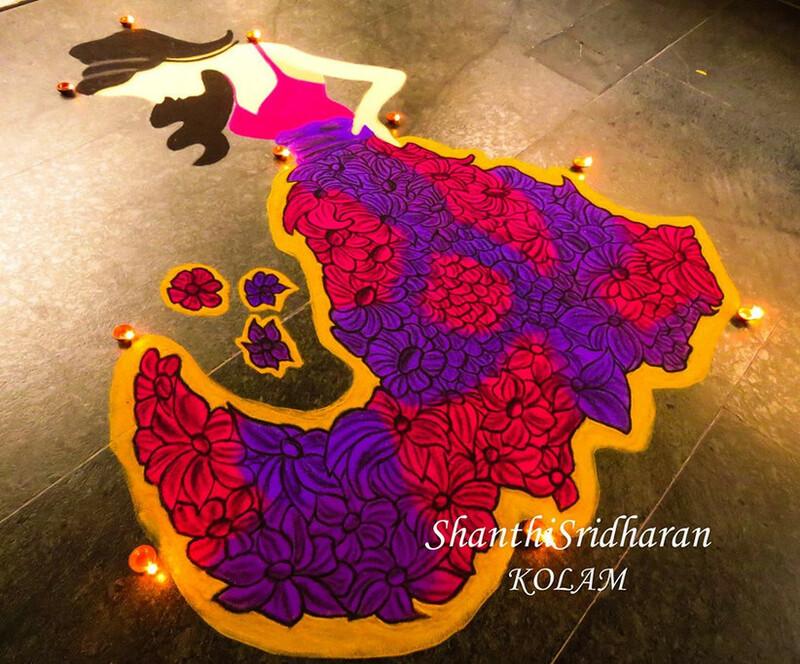 This rangoli design manages to give a vibe of minimalist yet detailed work, all at once. From a distance, it looks like a whirlpool of roses. Up close the simplicity of it all takes your breath away. Get creative with your rangoli designs and use everyday items such as bangles to make your work easier, fun and beautiful. This one is a #rangolihack right there. The domes and petals are great, but what really caught our eye was the detailing in the middle layer. Look how beautiful purple and black merge. The centre circle is a riot of colours whereas surrounding it is a serene white. 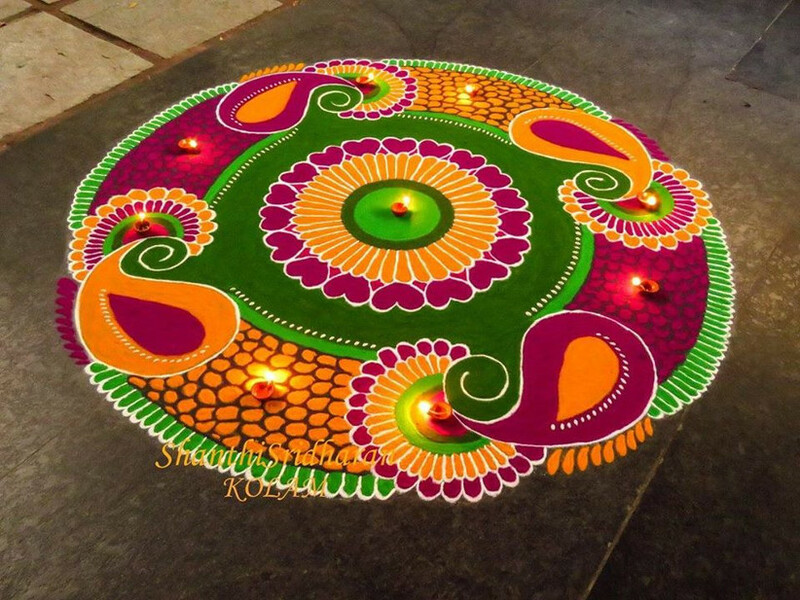 Brilliant idea for rangoli designs, isn't it? 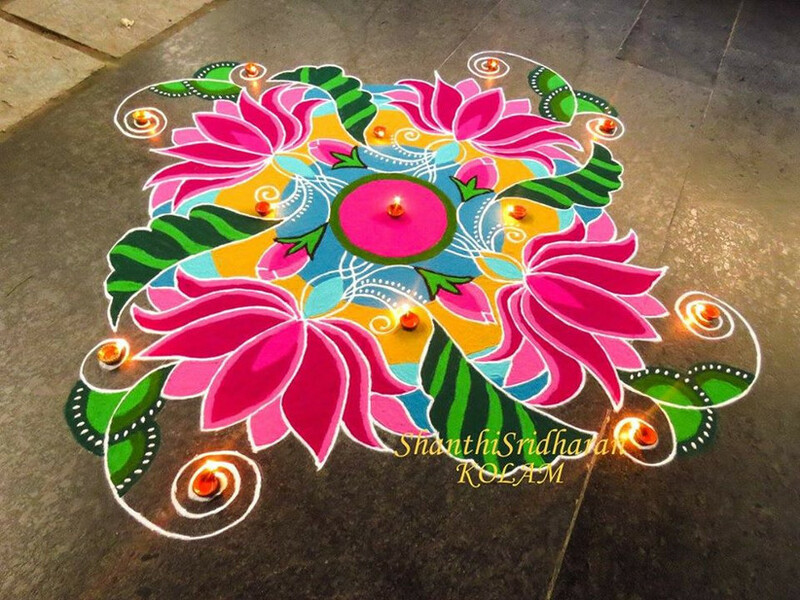 So much is going on in this rangoli design and we are awed by it all. 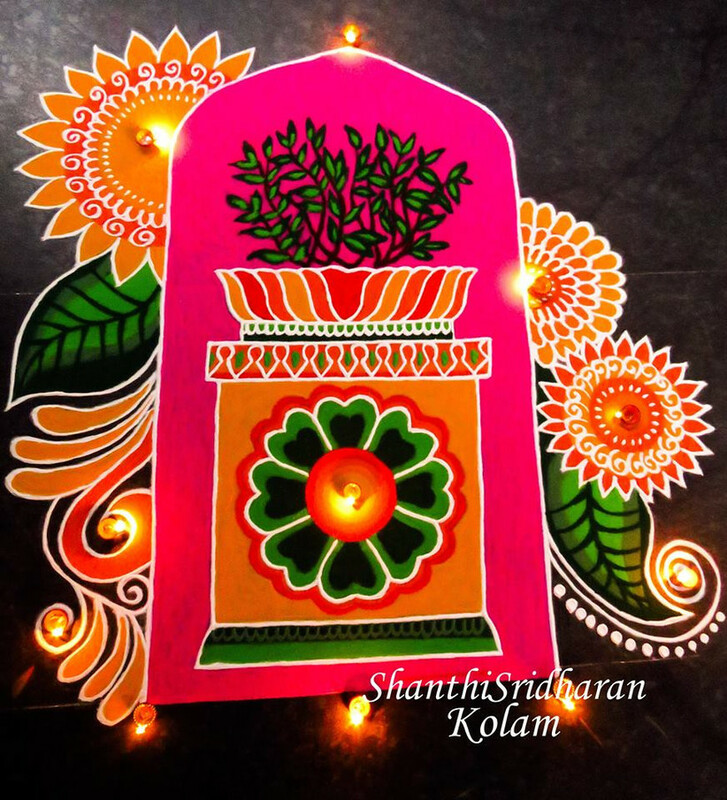 This half rangoli design is easy to make, and sure to please. 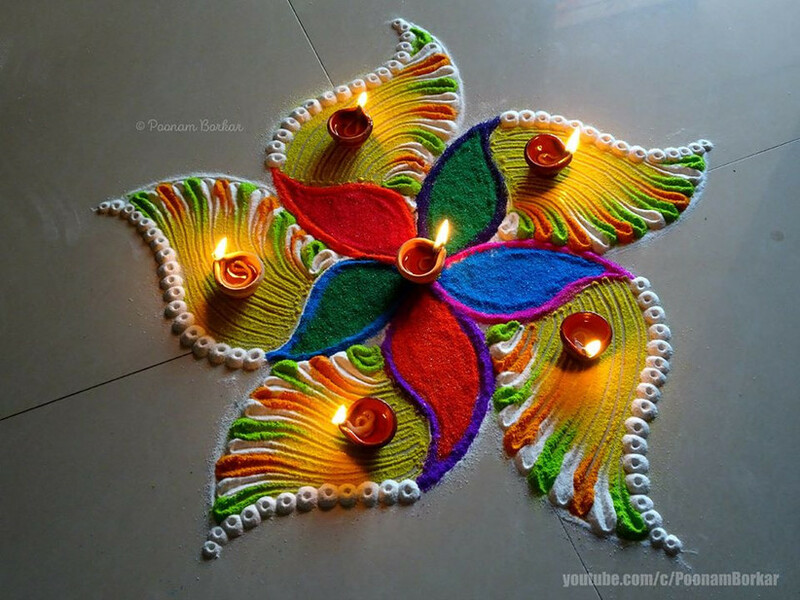 This one plays with just a couple of basic rangoli motifs, combined with a clever use of shadows - and yet the end result is so endearing. 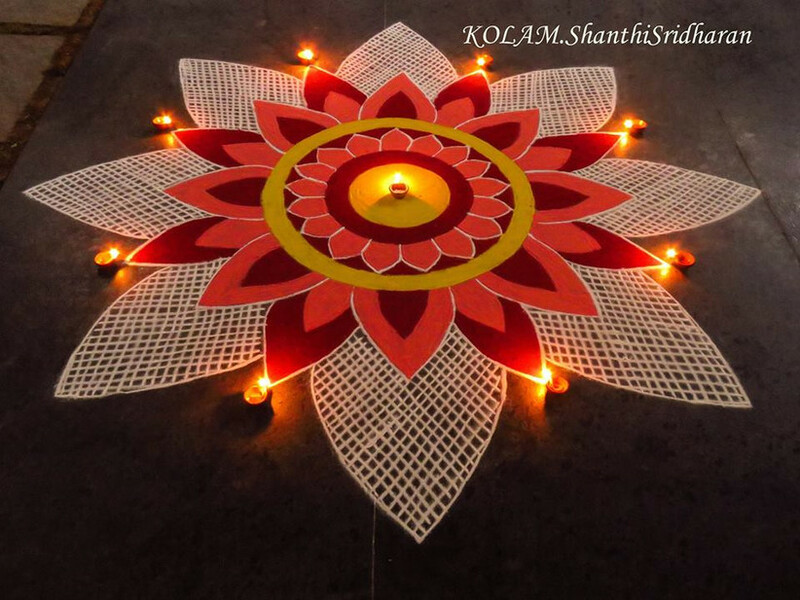 This is a great example of geometric rangoli designs. The square, though not visible, is ever present. 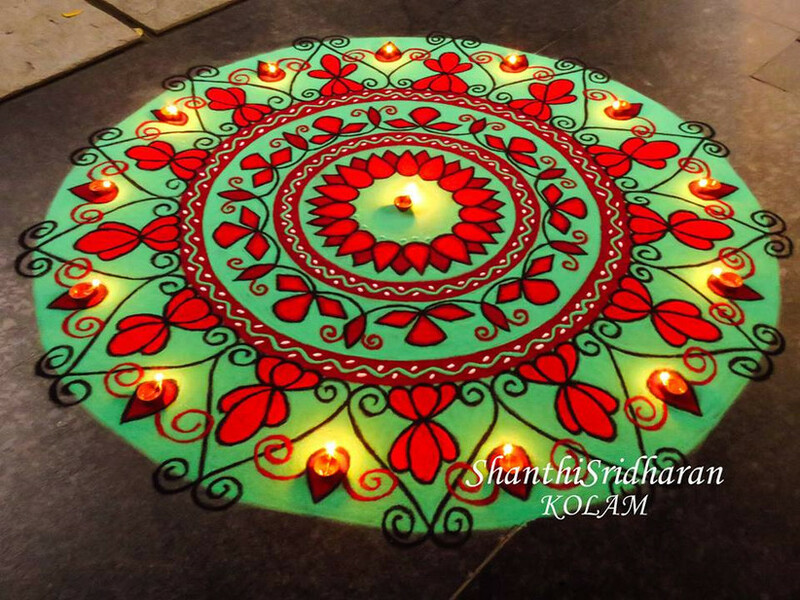 This spectacular rangoli design is achieved using minimal lines and dots. The block shades of pink and blue would be great if you're going for an overarching colour scheme. Even as you ogle at the colourful centre motif, the simple white mesh in the background gives it a neat and put-together look that's hard to achieve. 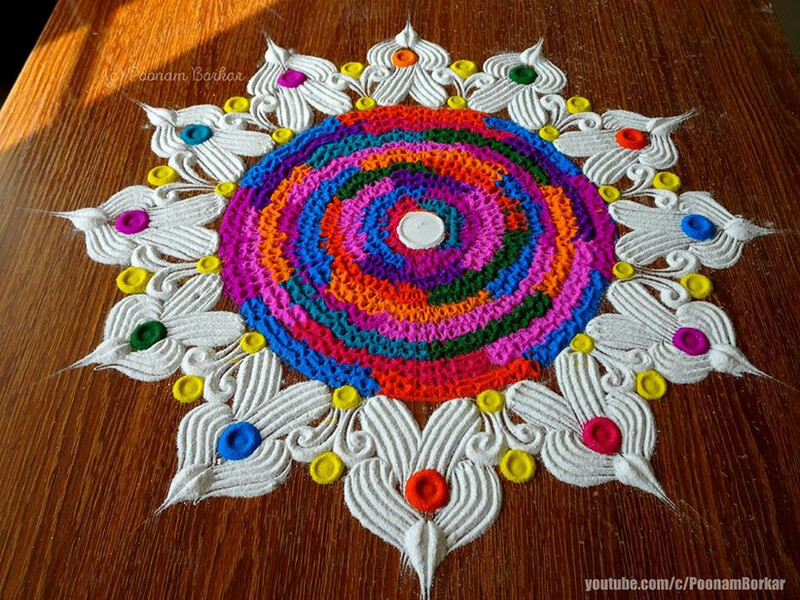 In the beginning, this might look like fairly simple rangoli design but don’t be fooled at the primary colours in the centre. The real hard work is in the white meshwork, which has come out beautifully. The Paisley motif takes centre stage in this breathtaking rangoli design. Even the combination of soft yellow and orange with green has worked out very well. Domes, Paisleys and leaves. If this rangoli design gets too complicated to execute, definitely consider this as the mehndi design for the back of your hand. 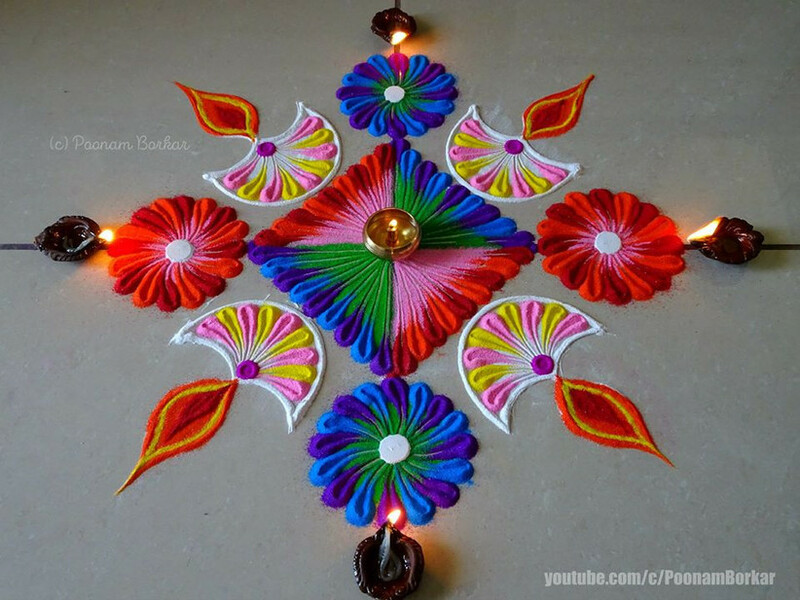 A simple rangoli design which becomes spectacular with repetition and precision. This is a great design for beginners to get their bearing and yet steal the show. 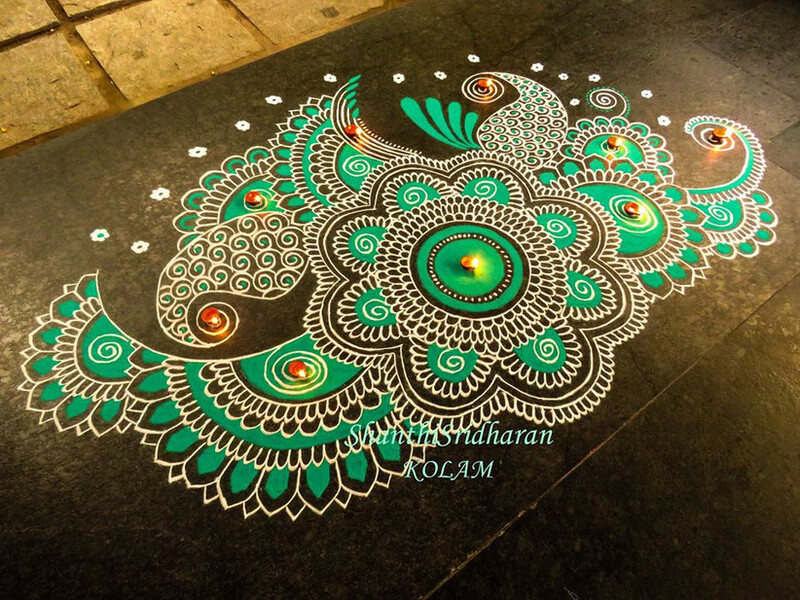 This rangoli design relies quite a bit on dots and the end result is fantastic. Another great design to start with. The concentric circles, embellished with domes and arches, give a royal look to this rangoli and the mustard colour is really pulling this off. A simple design which becomes accentuated with the use of white. 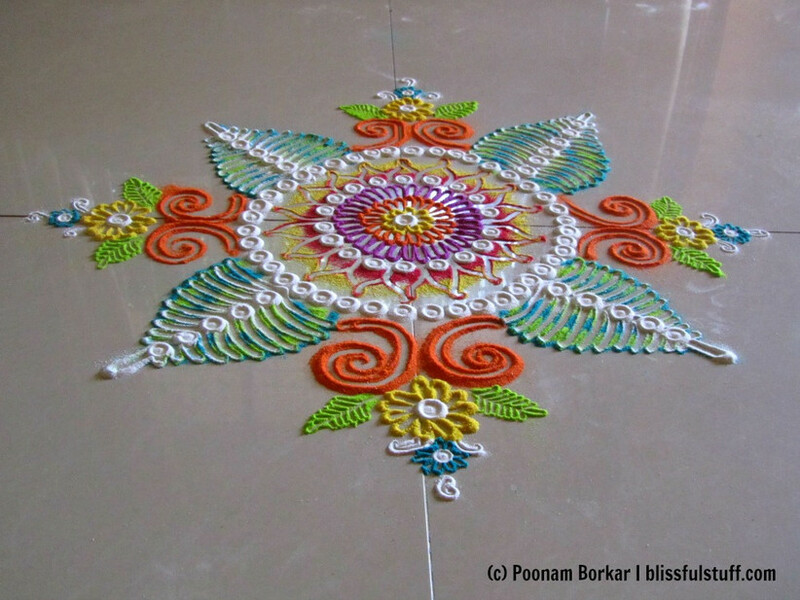 When it comes to rangoli designs, we feel white is quite an understated, but powerful element. Ah! Such pretty colours and marigold petals on this one. 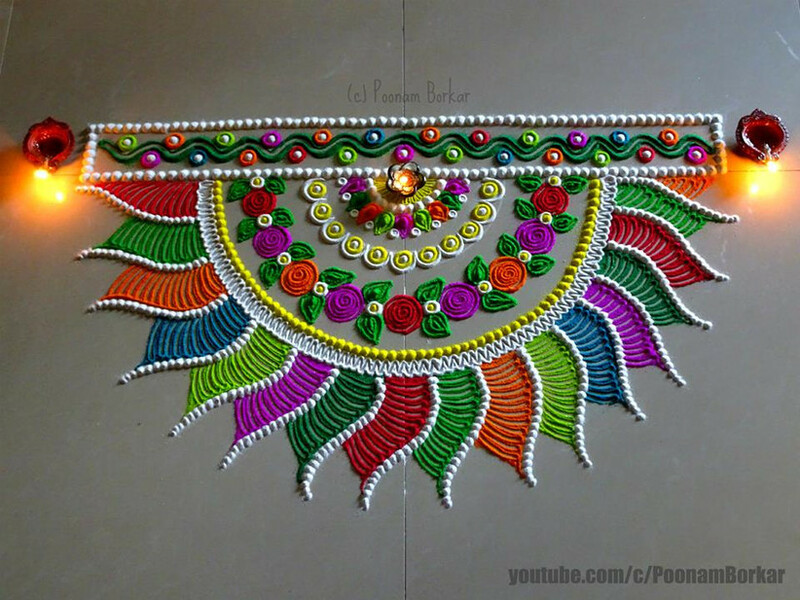 This rangoli design is definitely a must-have for a mehndi function. 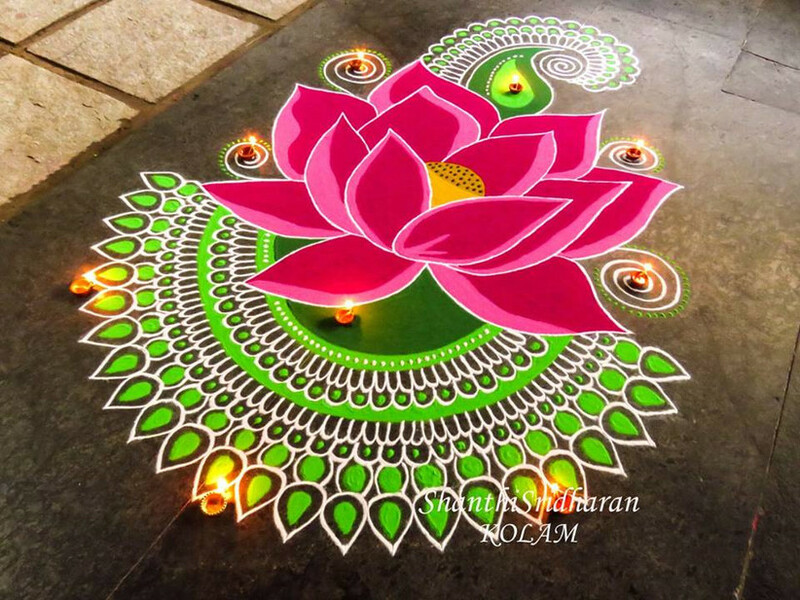 A combination of moons and lotuses, this rangoli design is definitely something which is not seen often. Notice the alternate shade of green in the moon shaped petals, you might have missed it in the first glance but it works wonders for the look. 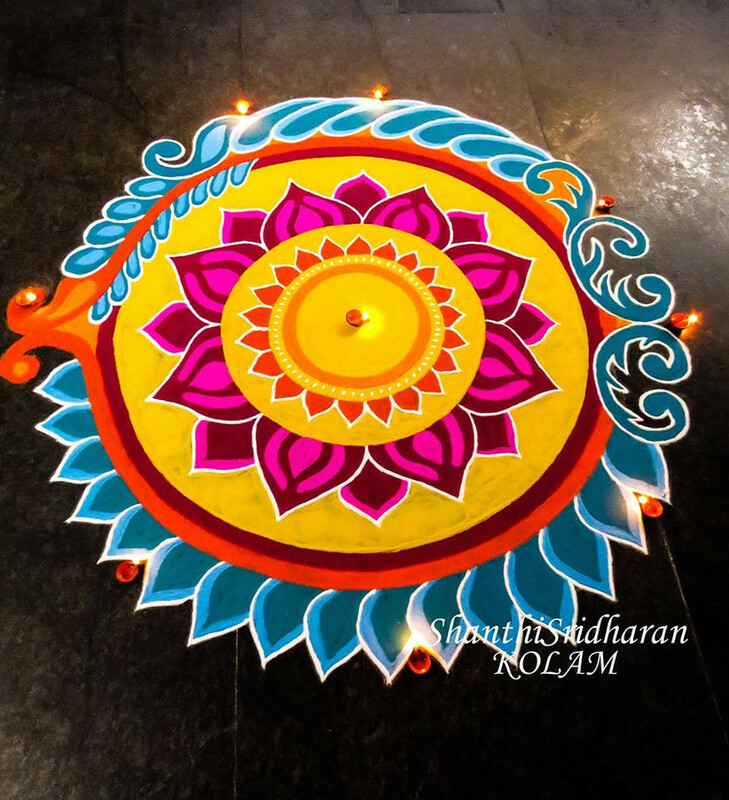 This easy rangoli design relies heavily on semi-circles, a motif which is both easy to make and lovely to look at. The colour scheme is the real show stealer. For the queen of hearts, this rangoli design is a must have at one of the wedding ceremonies for sure. Another favourite owing to the sheer brilliance of simplicity and colour combination. 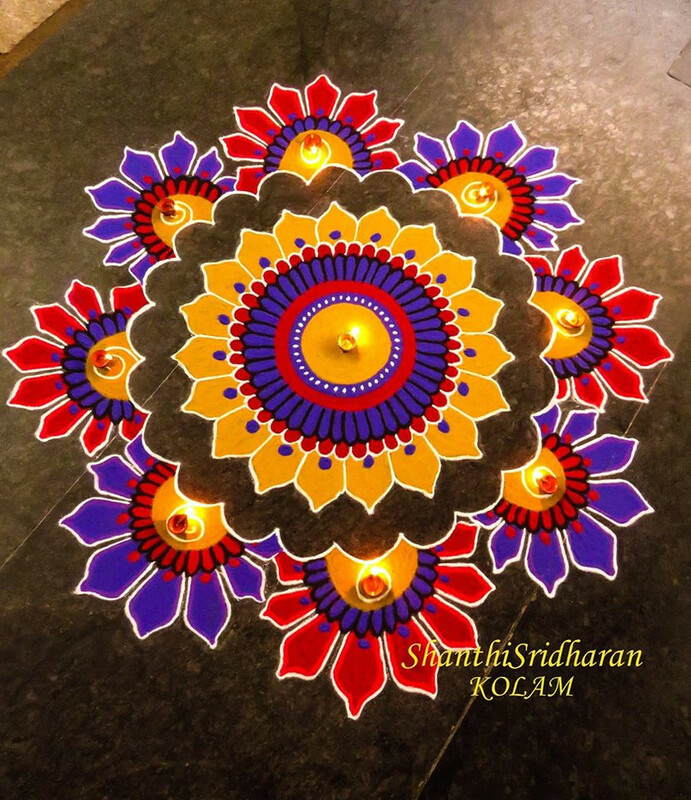 At first glance, it seems like one of the fairly complex rangoli designs but a closer look would reveal that the shapes are not that complicated and work great together. Just in case you have a sweet tooth and want to pay homage to all things baked and sweet, we have just the rangoli design for you. Try this French-heart rangoli and only let a chosen few into the secret. 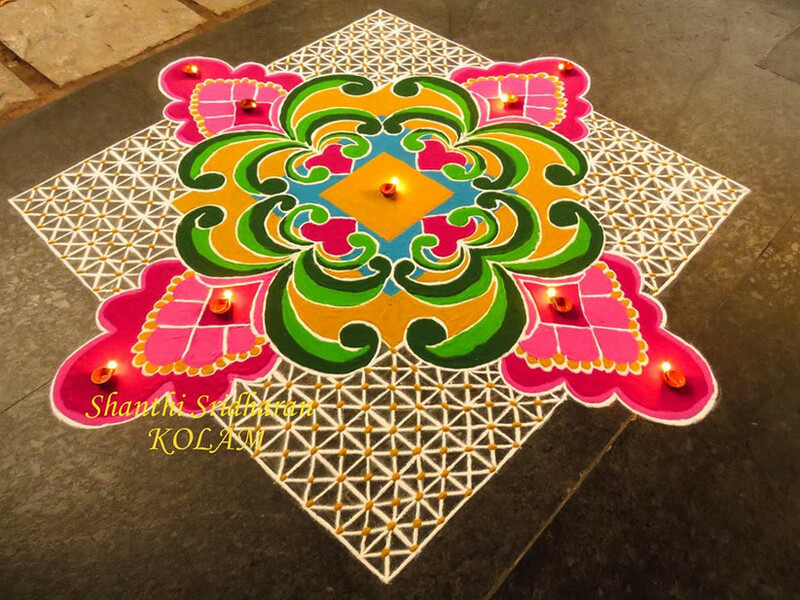 When on the topic of geometric rangoli designs, the square is also a very prevalent base structure. 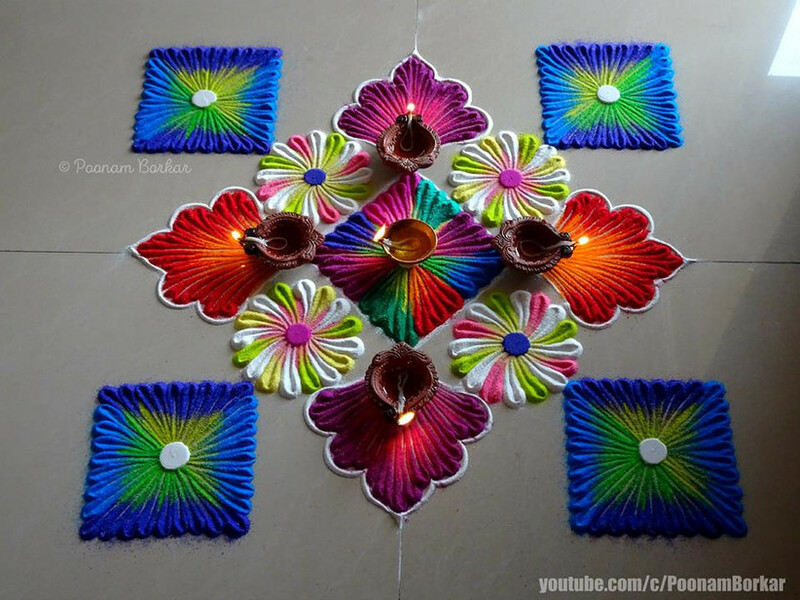 The four pointed Diyas at the corner, complemented with the real thing is the main eye catcher. 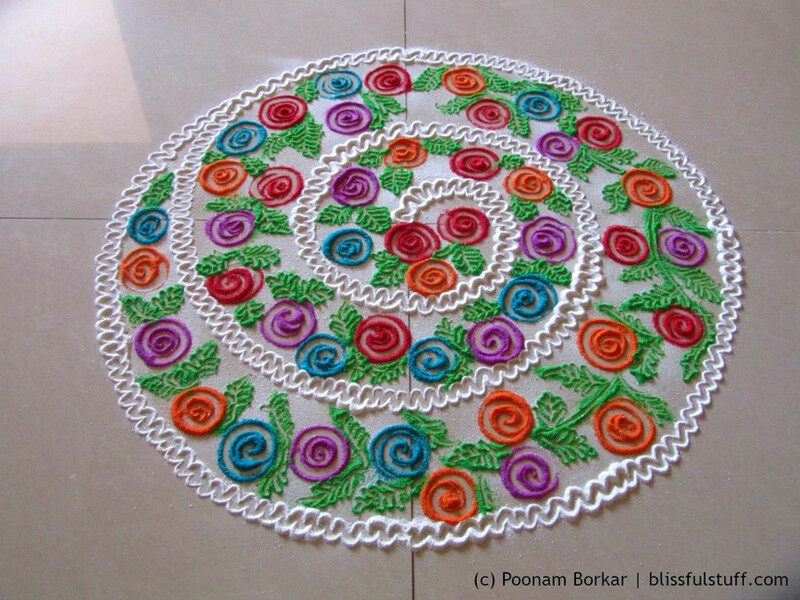 This rangoli design reminds us of all the doodling done at the back of school notebooks. The flowers and the swirls in the centre have a simple, and sweet charm. Loving the interplay of purple with pink and blue. 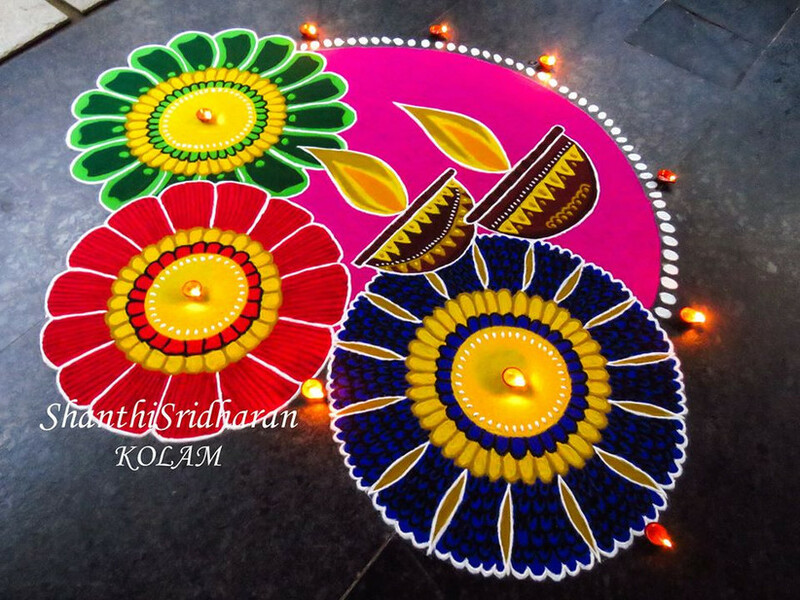 A perfect example of rangoli designs which require 2-4 colours and come out as detailed works of art. 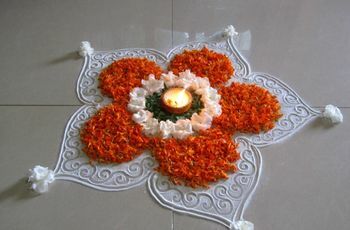 The main focus of this rangoli design is the Paisley (or the tear-drop) motif. But look at the amount of variety which can be achieved with just one basic shape. Paisleys and hearts. 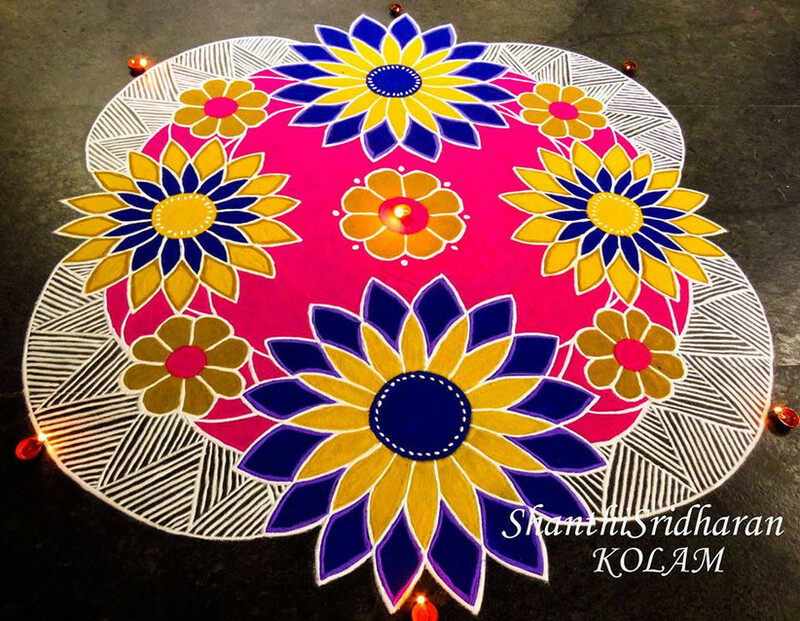 This rangoli design manages to bring together a free-form look along with the confinement of boundaries, without either imposing on the other. This concentric beauty must have taken quite some hours to come out so beautifully. 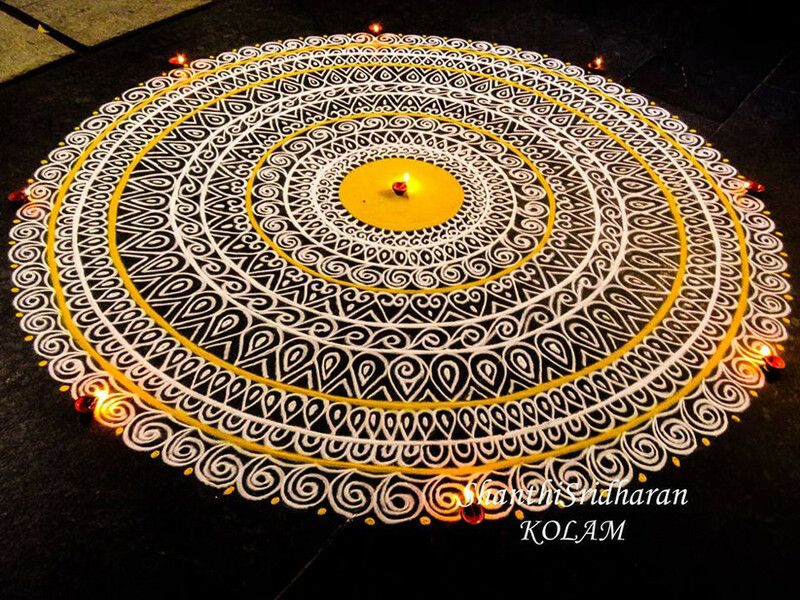 These are the kind of rangoli designs you daydream onto paper a million times before actually making them on the floor. 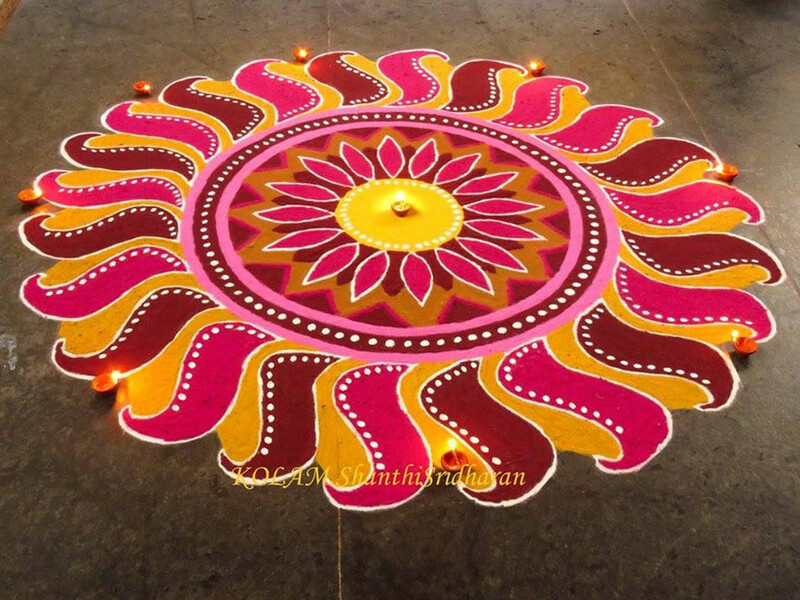 This ornate rangoli design is a great idea if you want to do something different and aesthetic. Teal isn't often seen in rangoli and even more rarely as the prime colour. The black patterns are giving it a wrought iron look which is surprisingly refreshing. 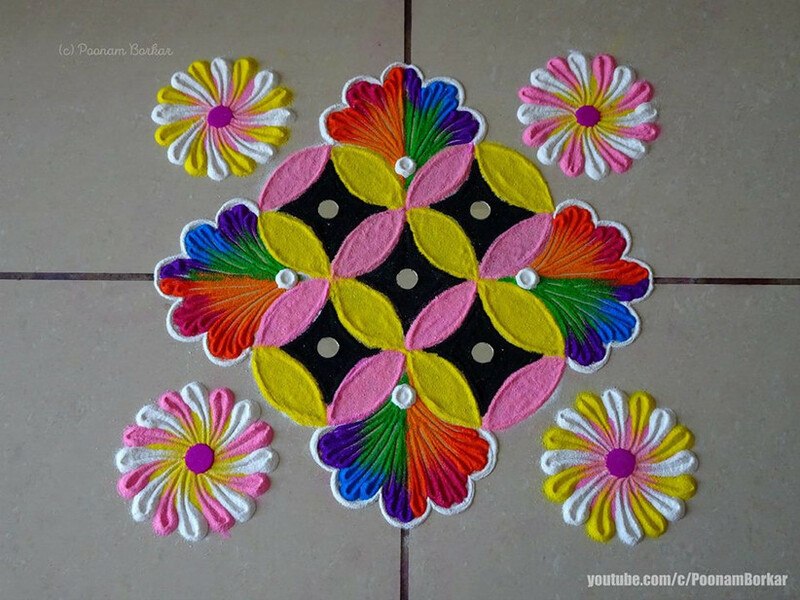 Simple shapes repeated often enough and made with the use of vibrant colours, makes this rangoli pattern a great idea for puja rangoli designs. These huge flowers serve a dual purpose. 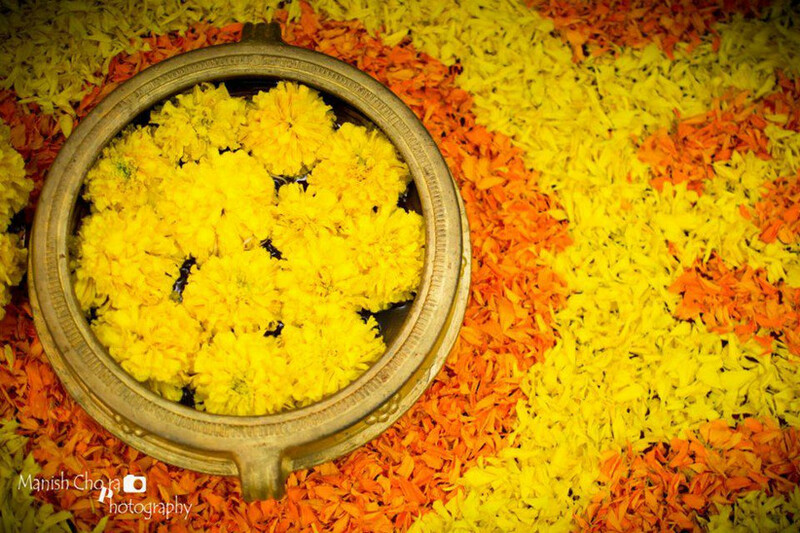 The marigold like petals and the bold colours with neat concentric circles make for the perfect backdrop for all the festivities. 75. Did Someone Order Bright? Loving the colours on this one. 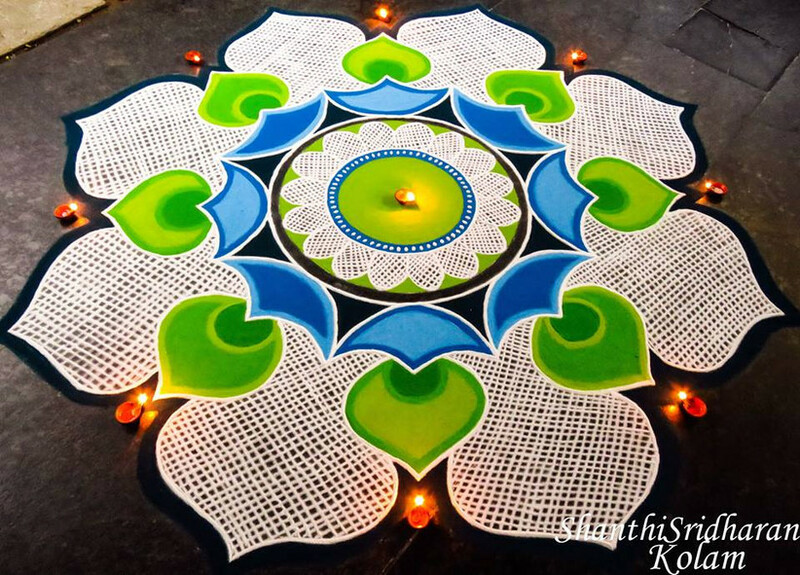 This simple rangoli design is especially appealing because of how it plays with easy-to-make shapes to make such a unique pattern. 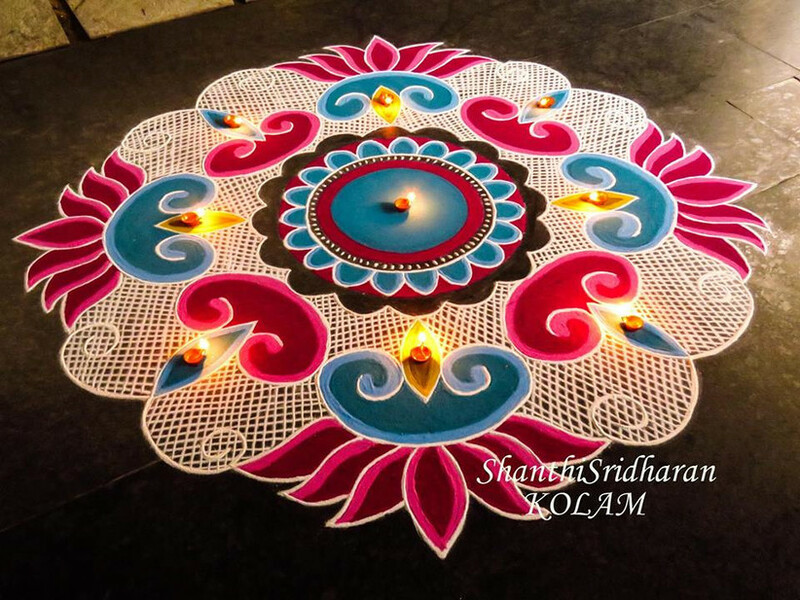 This simple rangoli design can be done in record time once you've mastered your circles and your mesh. 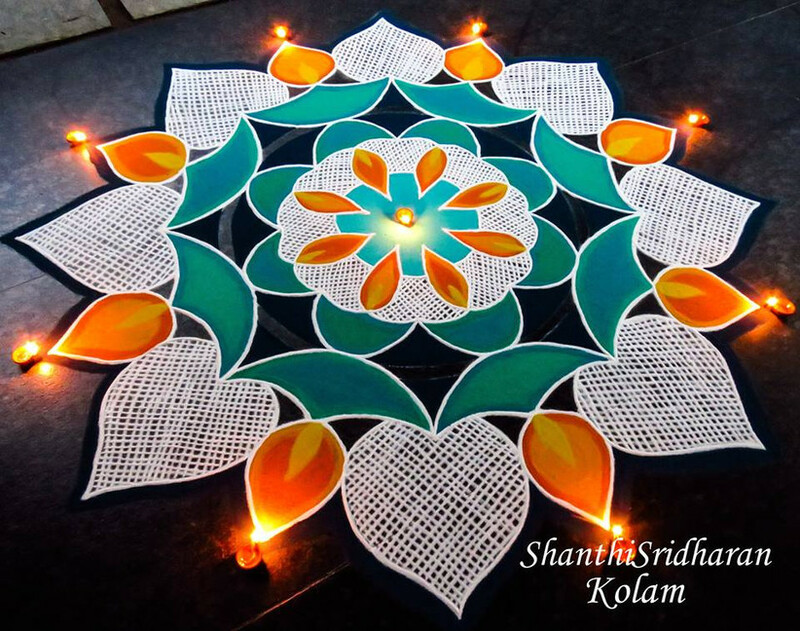 The only rangoli pattern that might take a bit of getting used to, is the lotus. 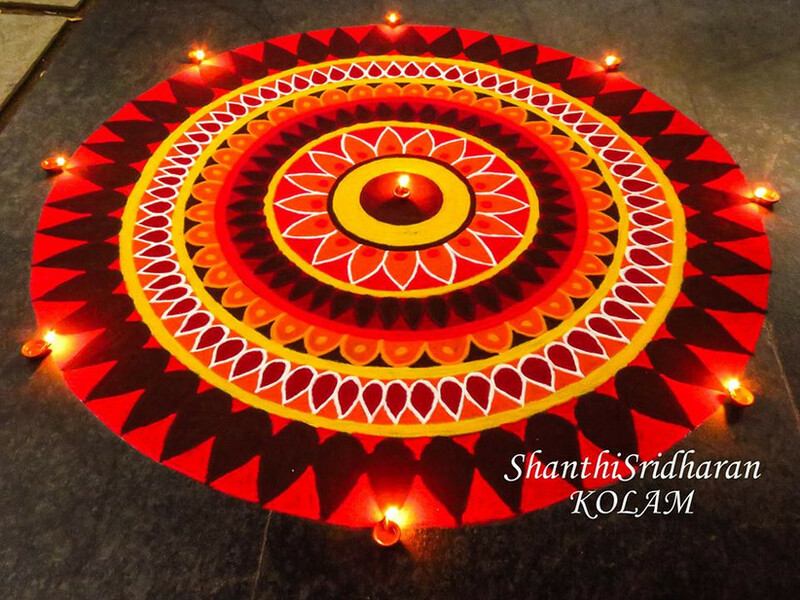 This striking rangoli design plays with basic shapes and stripes which add a whole other layer to the design without making it extremely complicated to make. 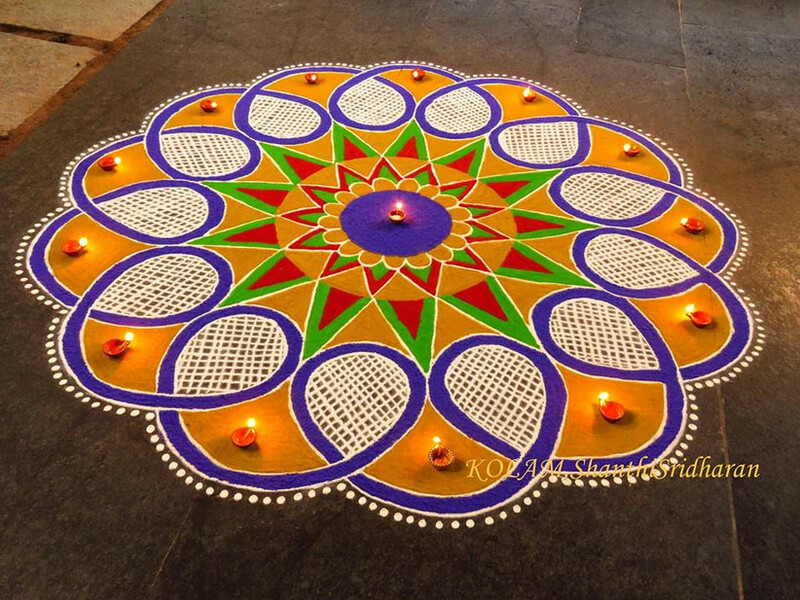 The use of stripes in the previous rangoli design made us think of one which is purely lines and stripes. 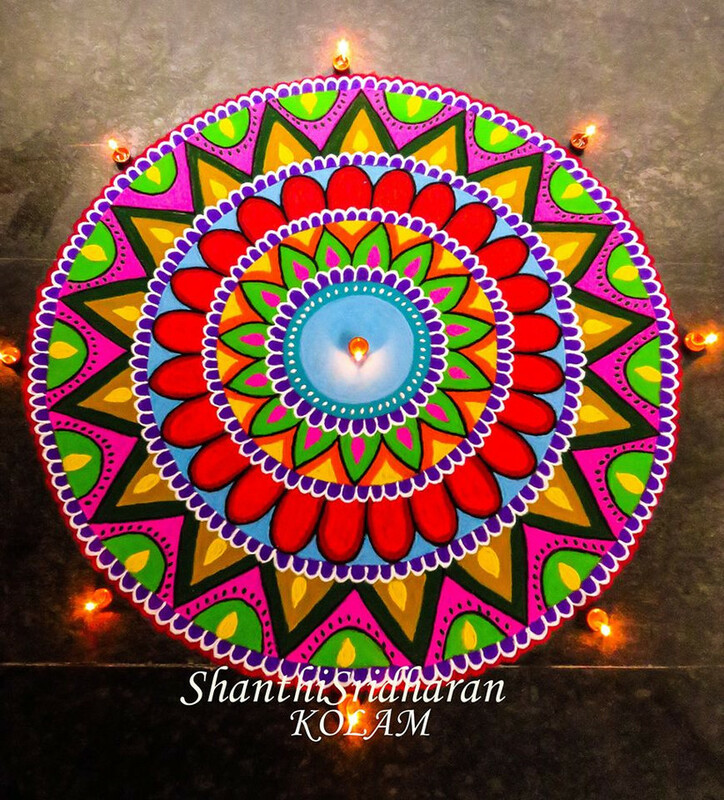 These concentric triangles merge well within each other, making for a simple and elegant rangoli design. 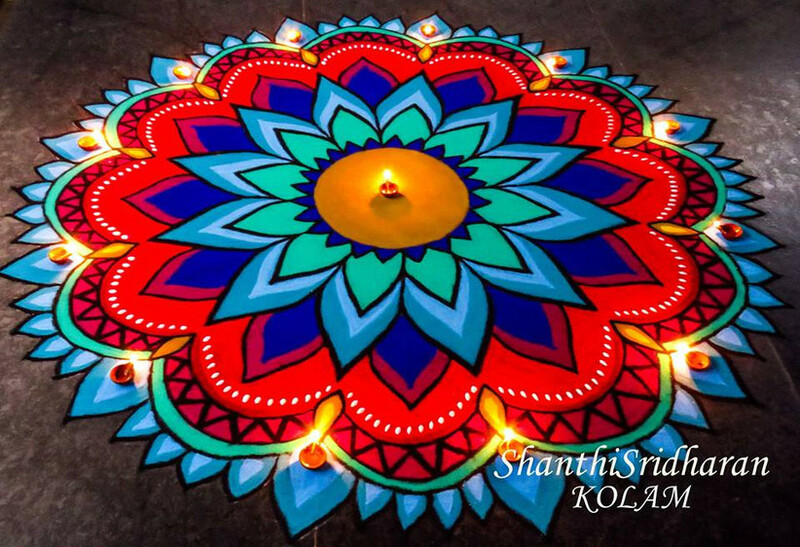 The single most endearing thing about this rangoli design is the cheerful colours and bold outlines which gives it a favourable buoyancy and crowd-pleasing appearance. Simple designs and patterns can work great if you know what you are doing. 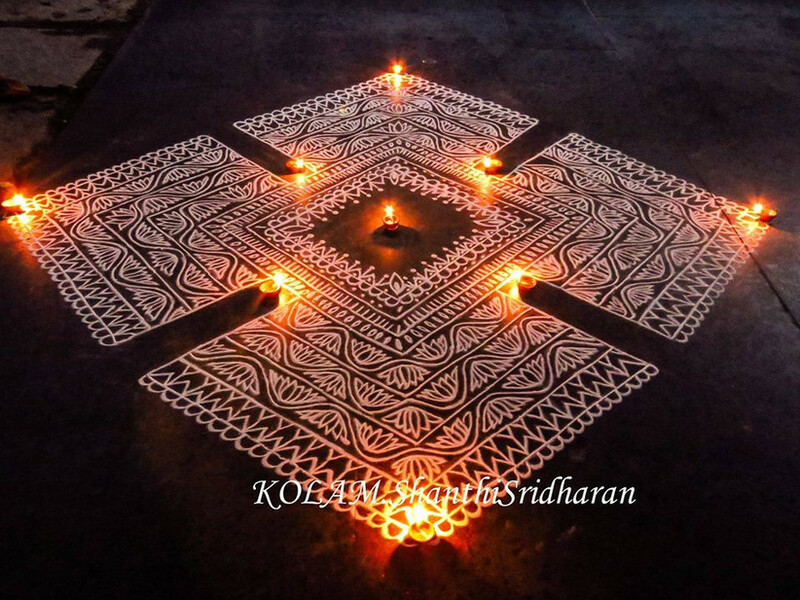 This rangoli design relies heavily on diyas and meshwork and makes for one helluva good entrance rangoli. 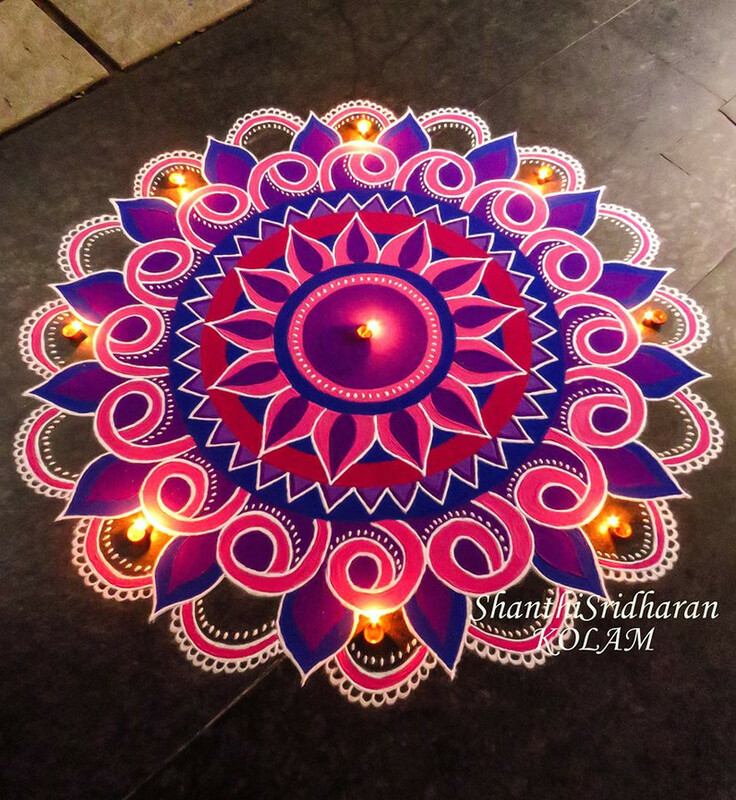 If the previous rangoli pattern was a bit too simple for your taste, try this slightly more complex rendition of the same basic design. Vibrant and lively use of bright colours and heart-shaped motifs. 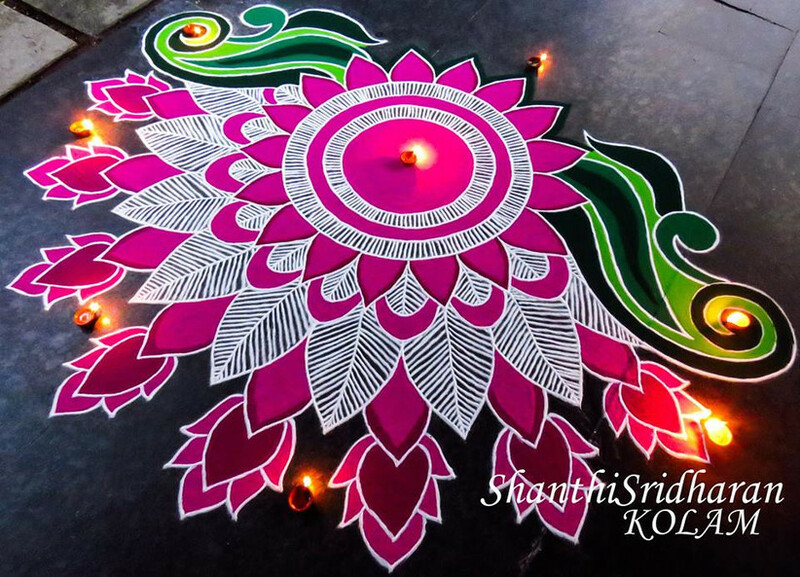 This rangoli design is good enough to paint on permanently. 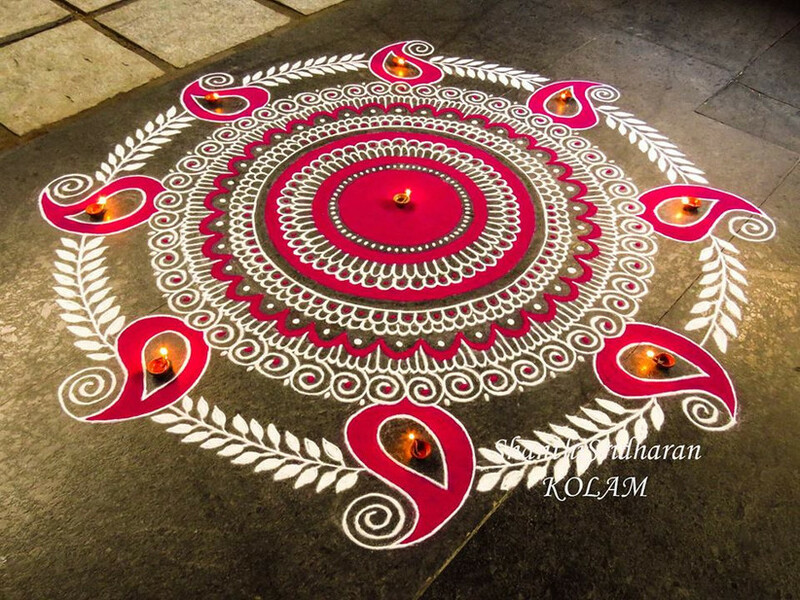 The simplicity of this rangoli design is what makes it so beautiful. Neat lines, and the excellent use of empty spaces to make the floor a part of the design, a clever and useful technique indeed. Teal and white make for a perfect combination. 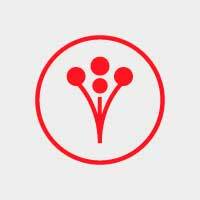 The central pattern is a simple flower which branches out to different designs. This design, though not as symmetrical as we've been seeing but just as appealing. 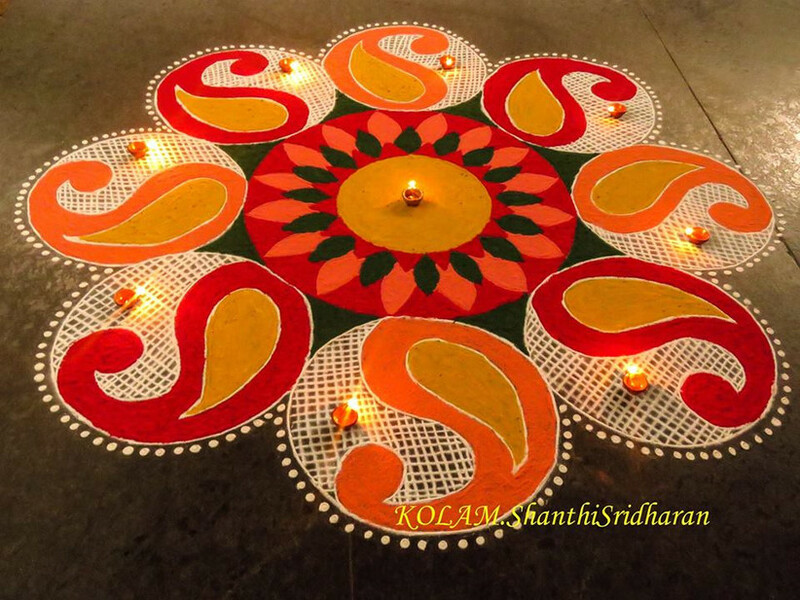 This is a brilliant rangoli design which uses yellow selectively while white does all the work. And yet the overall look is brought out by the dual tones equally. 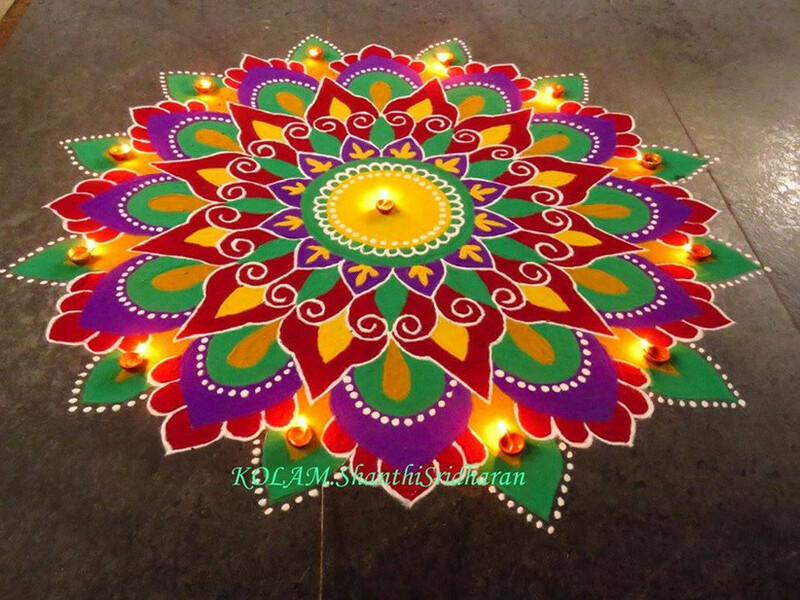 This rangoli design only uses one colour and the additional hues are added by outside elements such as the diyas' light and the floor itself. 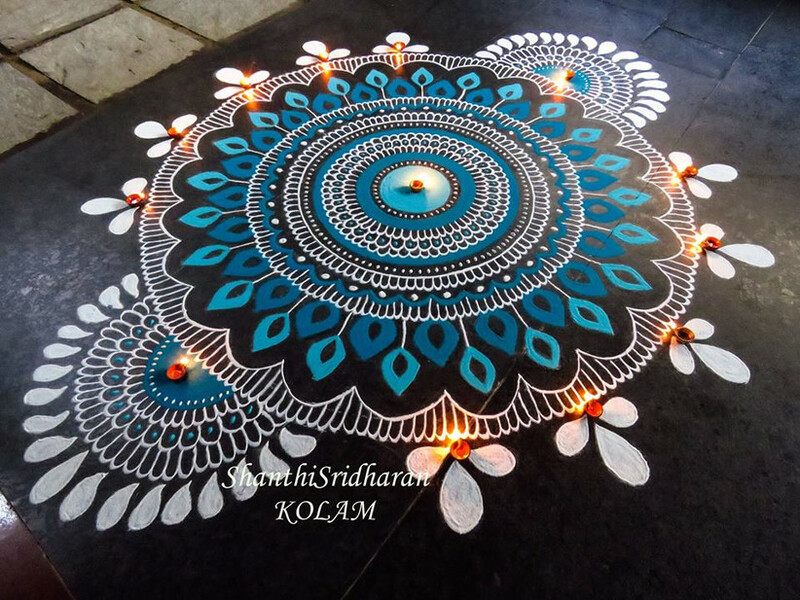 This unique rangoli design uses a couple of shades of blue to make some unusual rangoli patterns and the whole look is accentuated with the subtle yet intricate white. The pink and the white fuse together in this playful dance of swirls and paisley patterns. 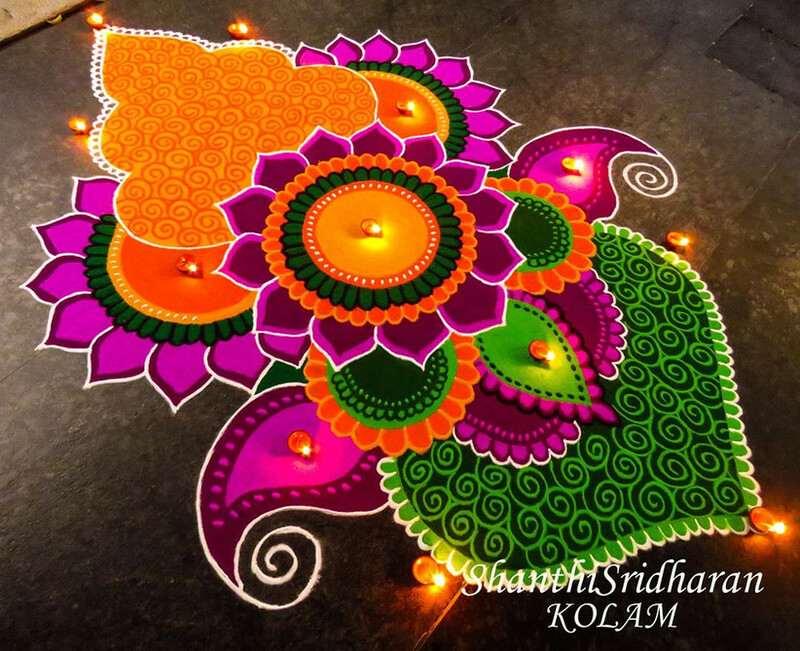 The leaves connecting the rangoli pattern together are simple to make and beautiful to look at as well. 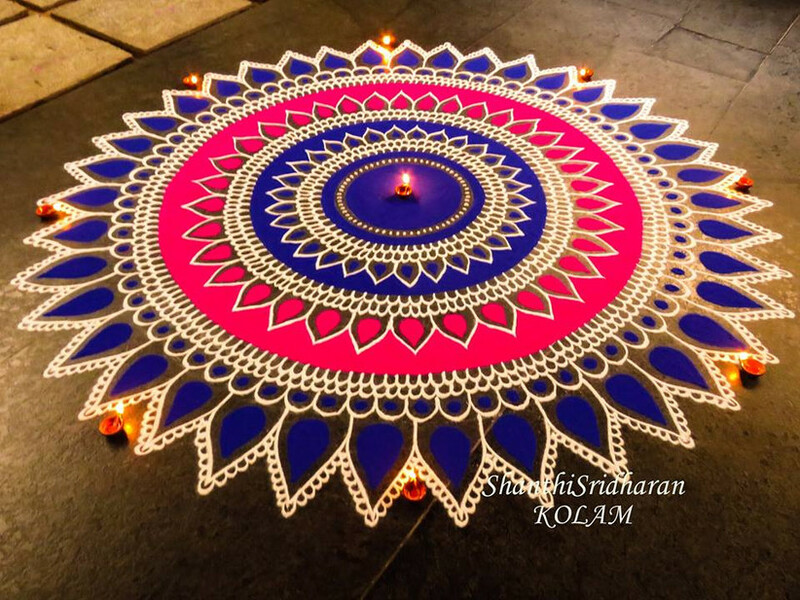 The thing we love the most in this rangoli design is how the diya's light adds a faint pink glow to this design made using only blue and white. Also, notice the precision and execution of the pattern. The colour red spells out festivities and joy like none other. 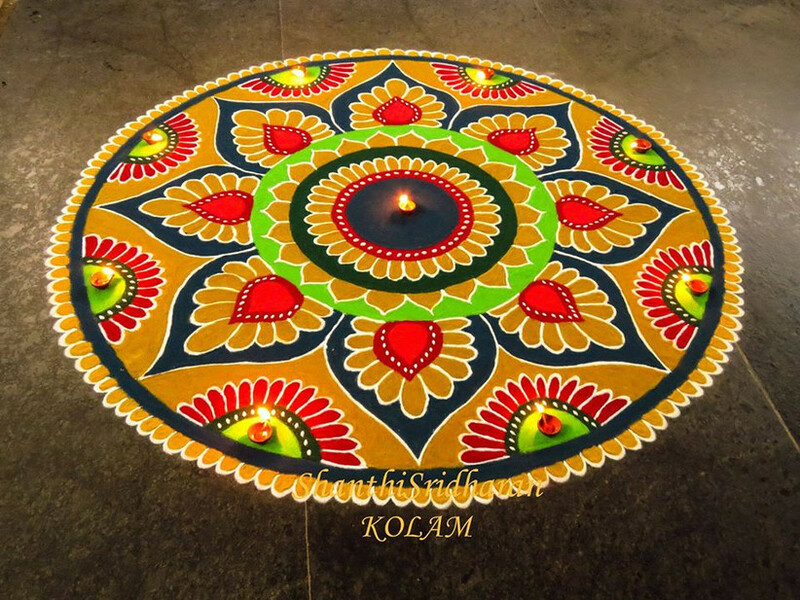 Make it the centre of attention with this intricate rangoli design. 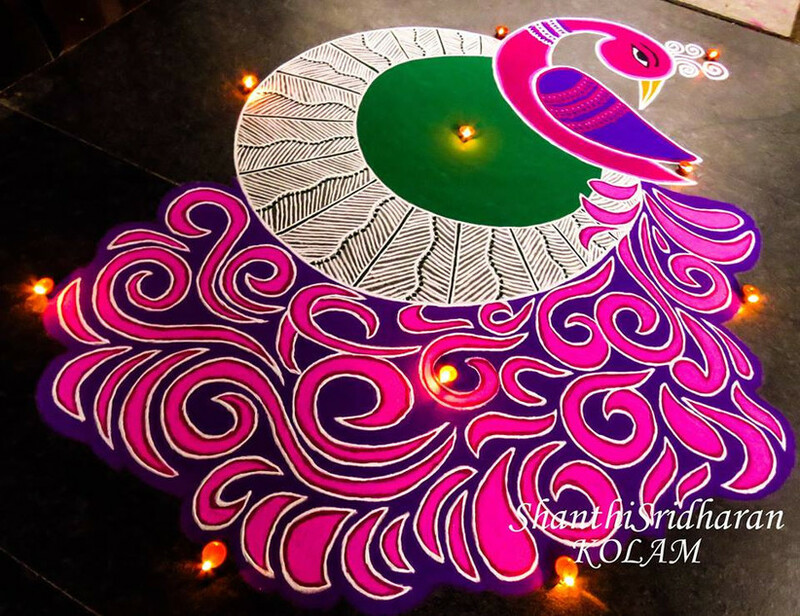 This rangoli pattern keeps the peacock at the centre of the design, making it beautiful by its subtlety. A very intricate design which seems perfect for the royal bird to be surrounded by. 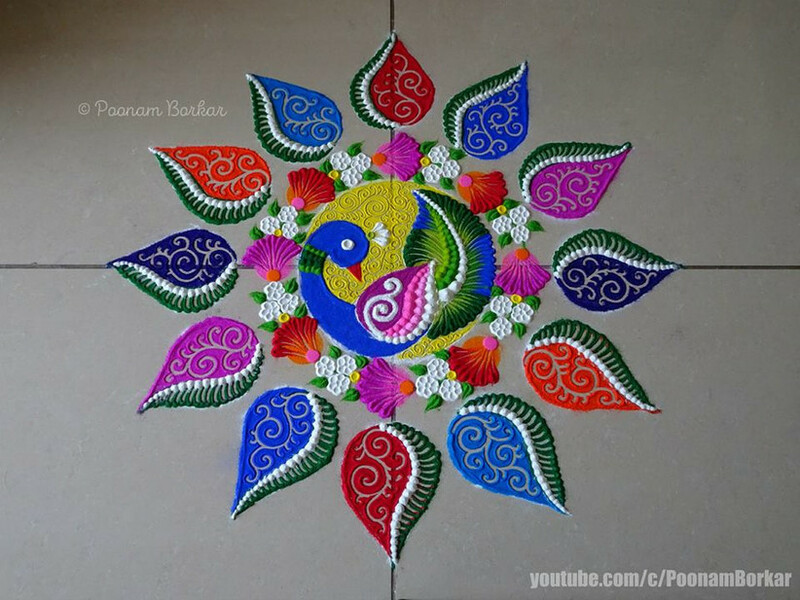 The plumage of the peacock is done with flowers in this rangoli design and adds a fresh look to the often repeated patterns. 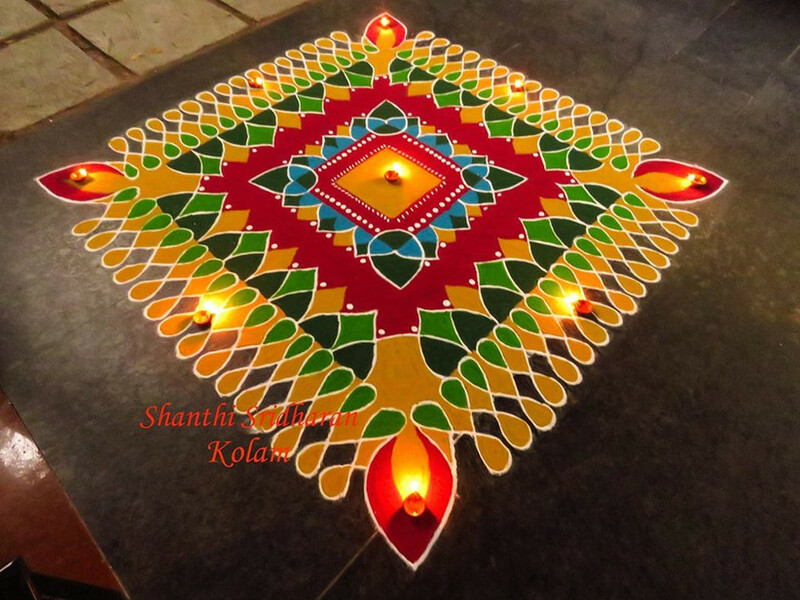 We love this rangoli design for its sheer simplicity. 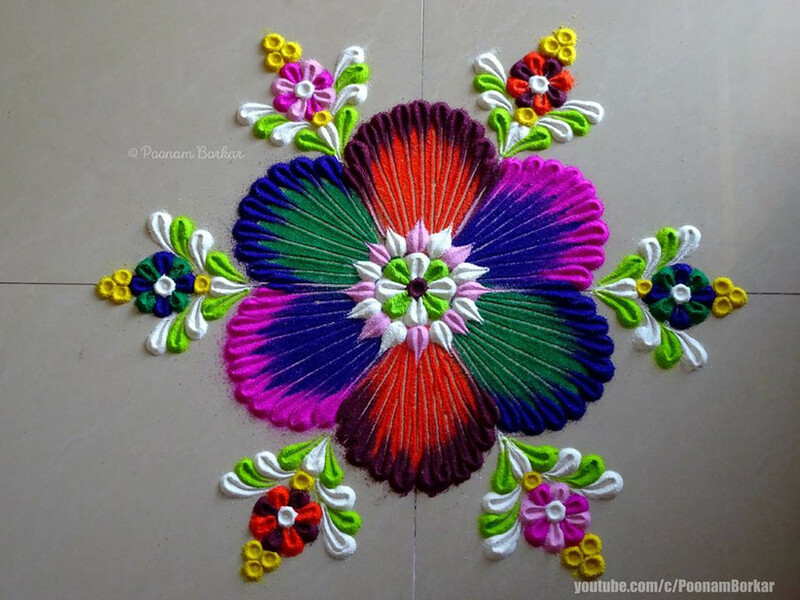 Made using only rice flour the rangoli pattern stands out owing to the flower garland all around it. Talk about regal. 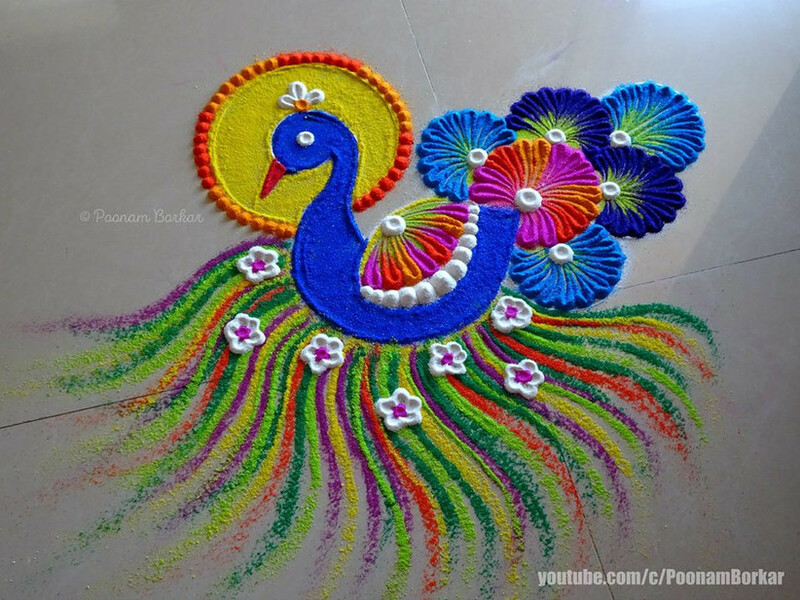 The plumage of this particular peacock is done beautifully and spans a vast portion of the rangoli design. 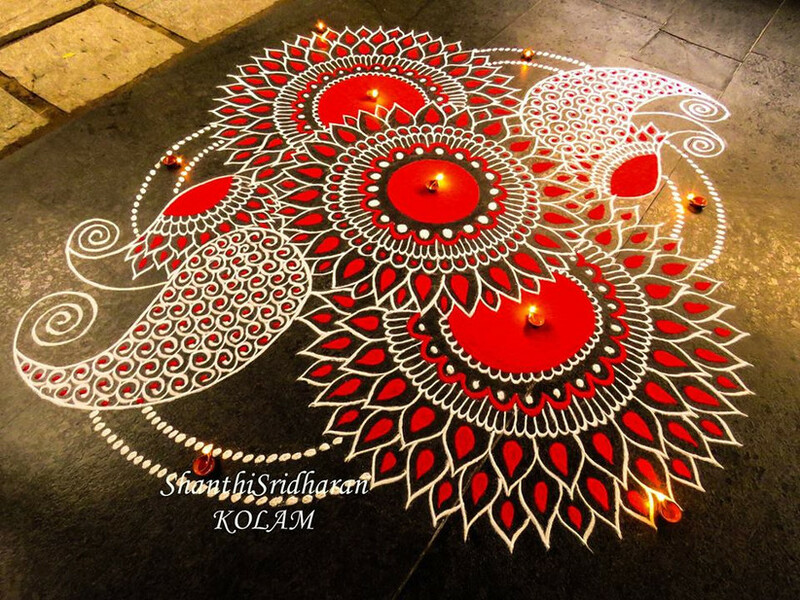 Compact yet intricate, what's not to love about this rangoli design? Love peacocks and can't get enough of them? Check out these peacock work blouses for some couture inspiration. 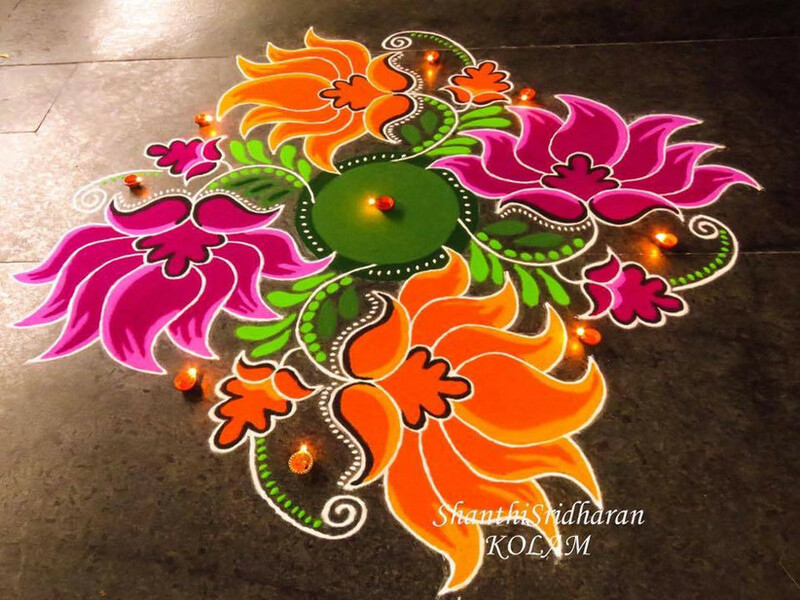 Loved these traditional rangoli designs? That’s not all. We have quite a few amazing ones stored up for you. 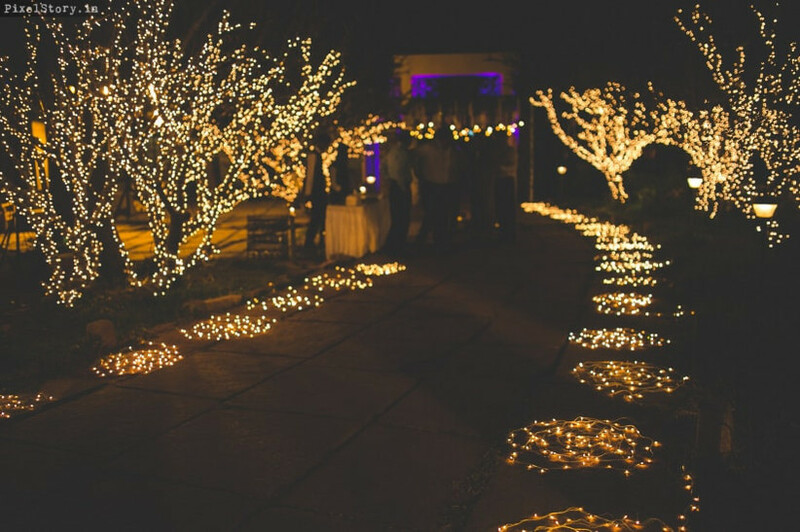 These are unique in their concept and execution and should be all the inspiration you need for your wedding decor. 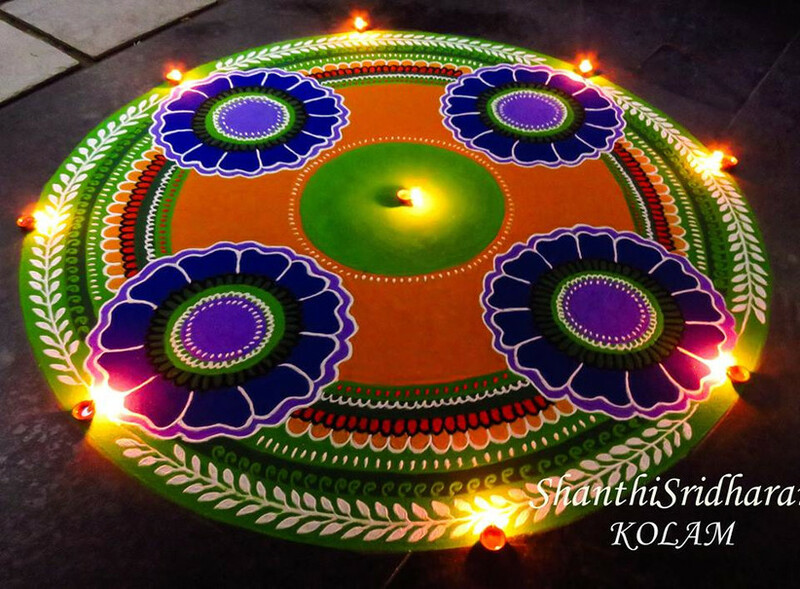 The Kalash is a very important part of all Hindu rituals and it is not uncommon to find it in rangoli designs. This one here makes fantastic use of floral motifs to give an impression of a Kalash. 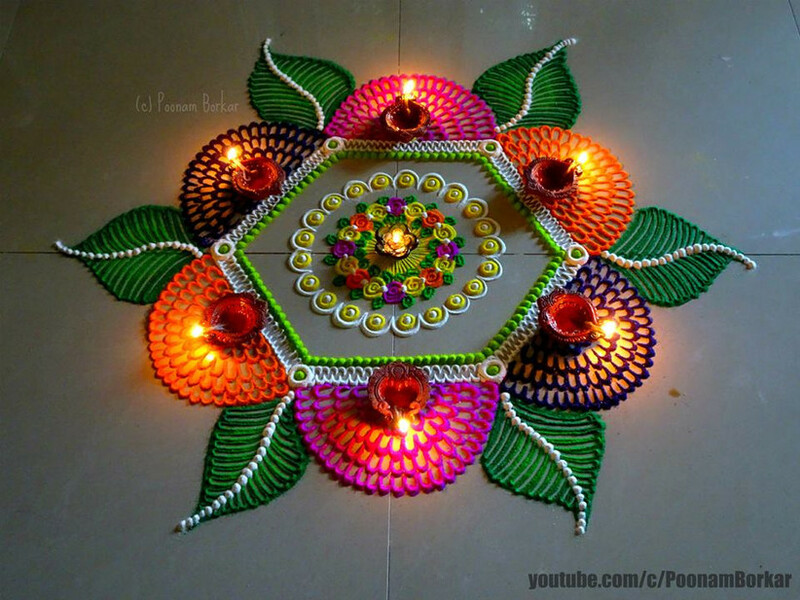 This is a great puja rangoli design. The pattern depicts a Tulsi plant which is sacred and would be perfect for the area near the mandap. Want to try something different? 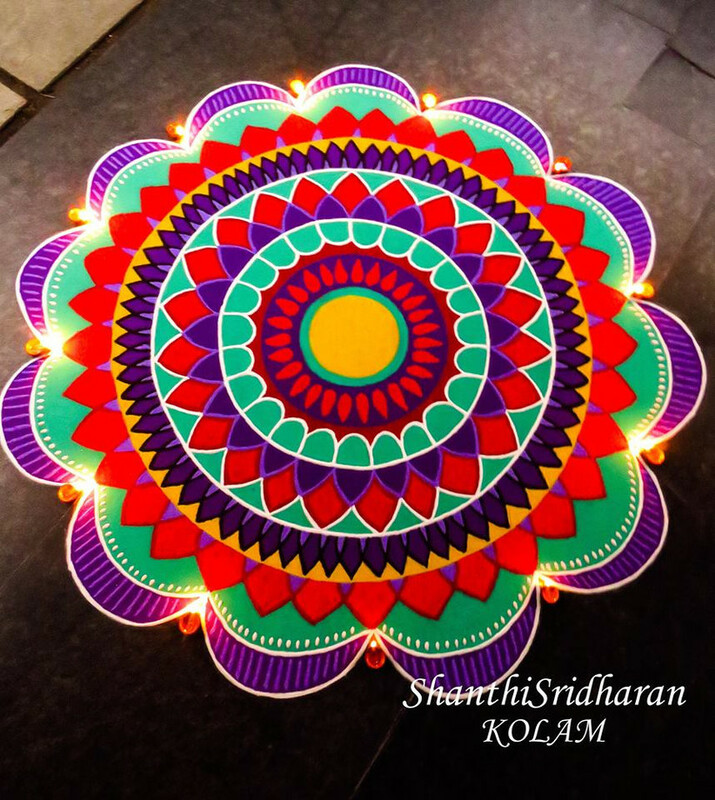 What about rangoli designs made entirely with fairy lights? Need we say more? 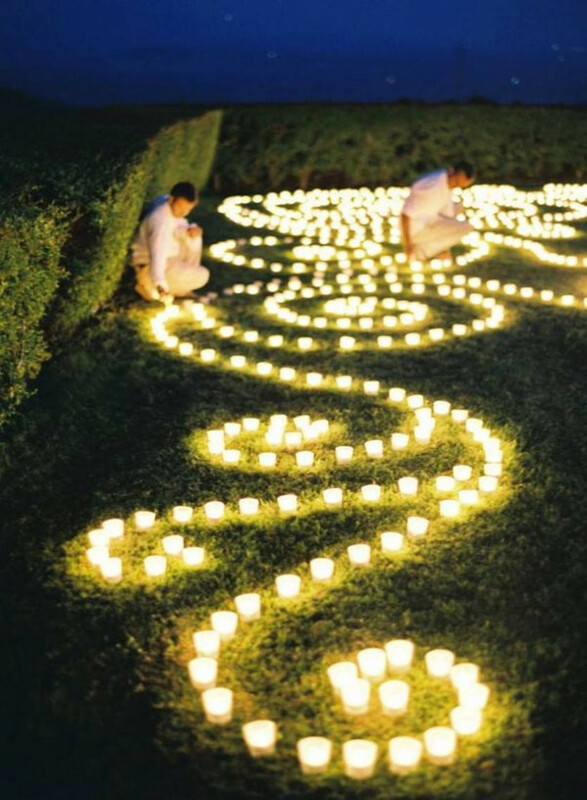 Taking the motif of light and love forward, how about this beautiful Rangoli decoration with candles? Perfect for an evening engagement ceremony. 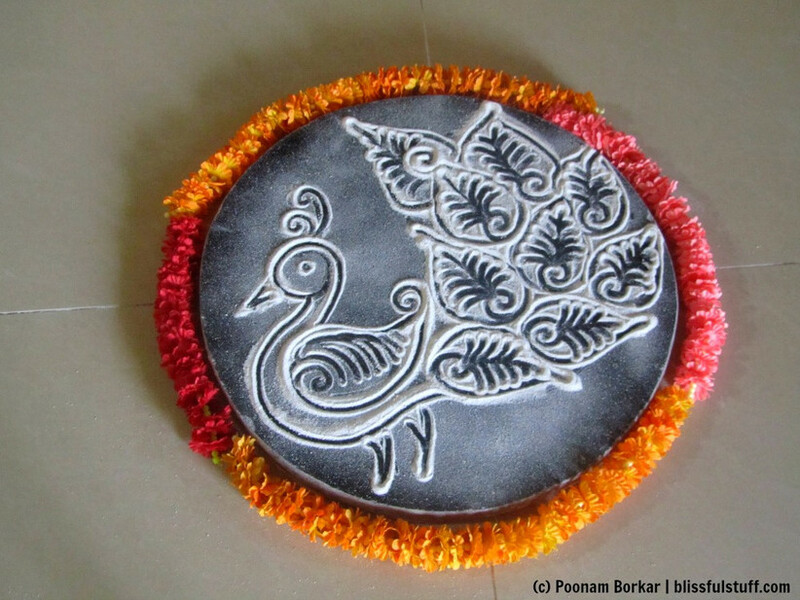 When it comes to rangoli designs for doors and borders, try this one for simplicity. And drumrolls, the most unique rangoli design we found for the bride-to-be. Try this one for its appeal and one of a kind look. After all, the guests should know that it's Papa's princess who's getting married. 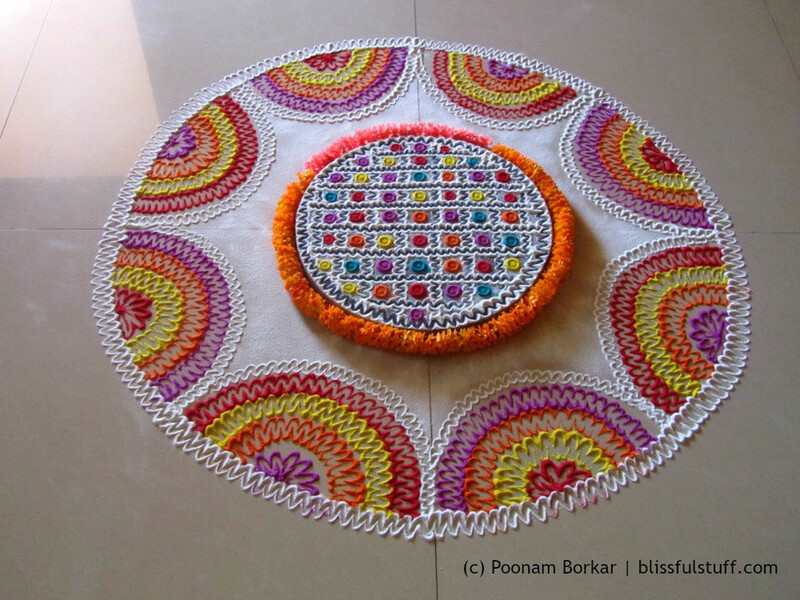 Rangoli designs and patterns are not just soothing to look at, making them is very calming too. 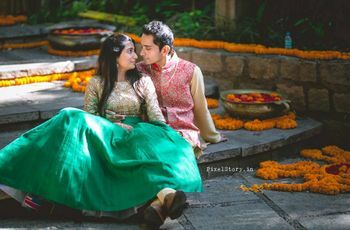 Hope you are inspired by these patterns and would have them at your wedding and every important function and celebration through your married life. 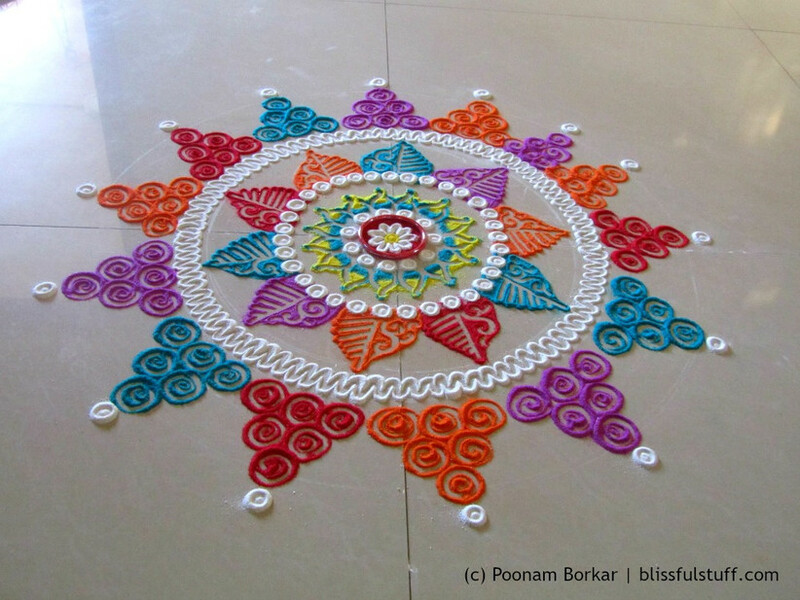 Tried a few of these already, or got even more gorgeous rangoli designs to share? The comments are just for you.